Plettenberg Bay, or “Plett” as the locals call it, and the surrounding area is a place I could spend a lot more time. Like a month or so. At least. From the beautiful lush coast landscape, including hiking trails and National Parks that run along the beach, to the extensive wildlife, including the Birds of Eden Bird Sanctuary (the second largest aviary in the world; so big it doesn’t really feel like you are in any type of enclosure), a Wolf Sanctuary, a Lion Sanctuary, an Elephant Sanctuary, a Leopard Sanctuary, and more. There’s also the adventure sports here: the Bouji?? Bungy Bridge (highest bungy bridge in the world), paragliding, kite surfing, shark diving, kayaking, surfing, etc. 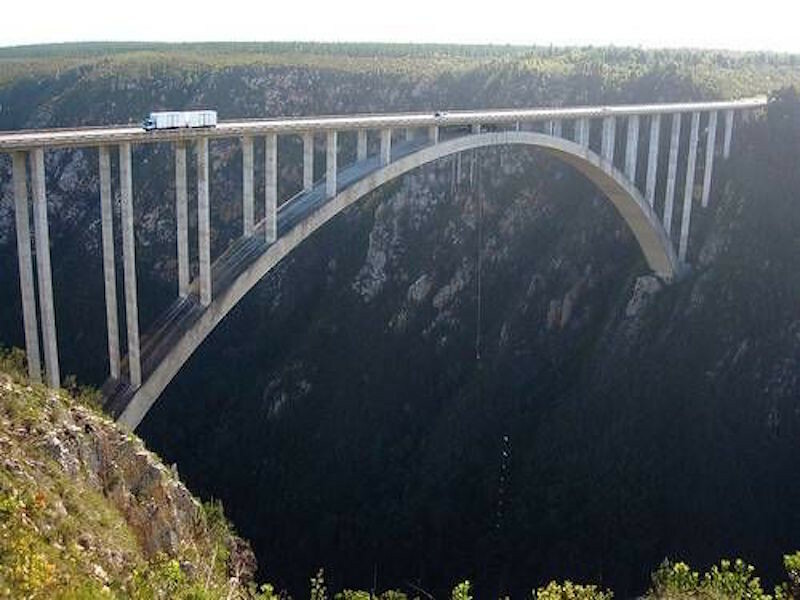 World’s highest bungee bridge at just over 700 feet. Uh, maybe next time. Or not. I will definitely return to Plett. I am feeling guilty that I don’t have enough time to see and do everything I want to experience here. But unfortunately I’ve created a bit of a schedule for myself that I am going to have to somewhat stick to. I don’t have a hard-and-fast daily schedule, but I have a limited amount of time to cover this continent and the next, while staying within the preferable weather window. 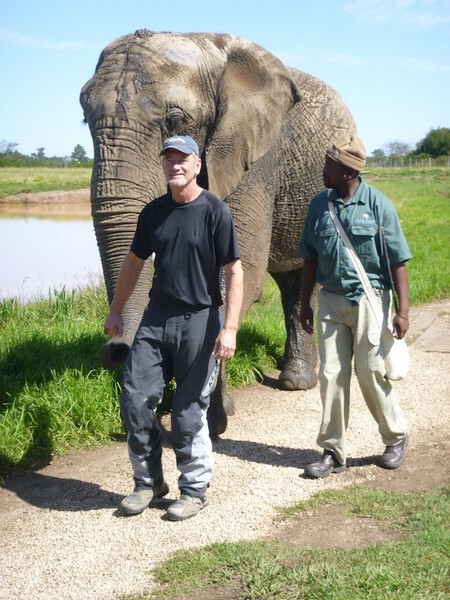 The elephant just grabbed my hand with her trunk, and we walked along like that…. Ok, so maybe it wasn’t quite like that. 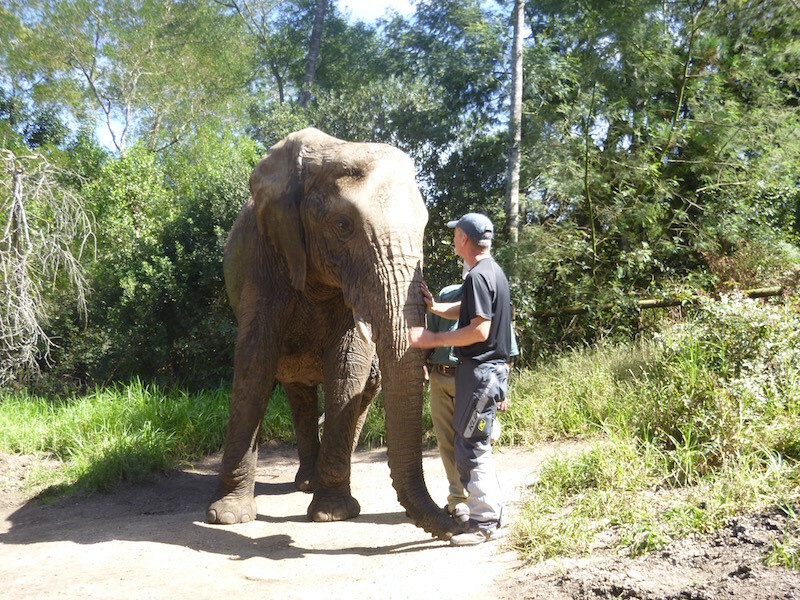 I stopped at the Elephant Sanctuary, where not only did I get to walk trunk-in-hand with the elephants, but I learned a tremendous amount about elephants. 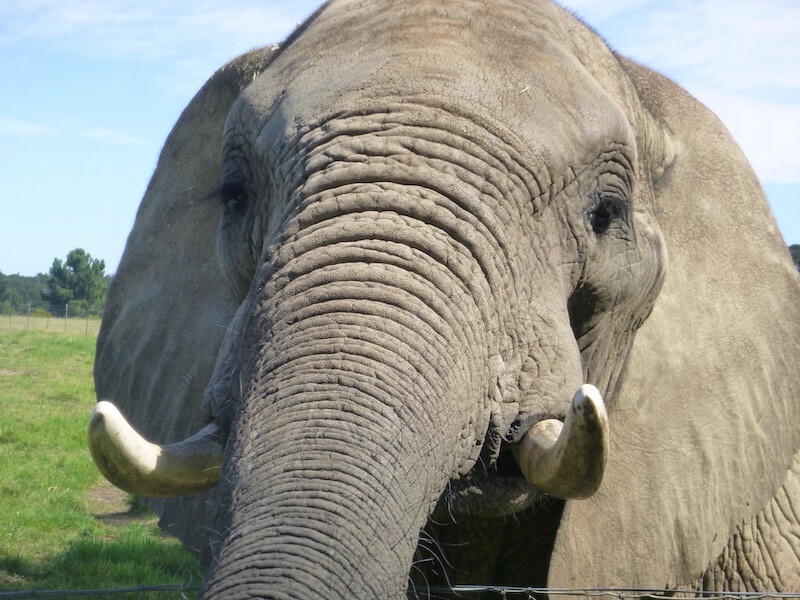 For example, one big difference between an Indian Elephant and an African Elephant is the size of their ears. 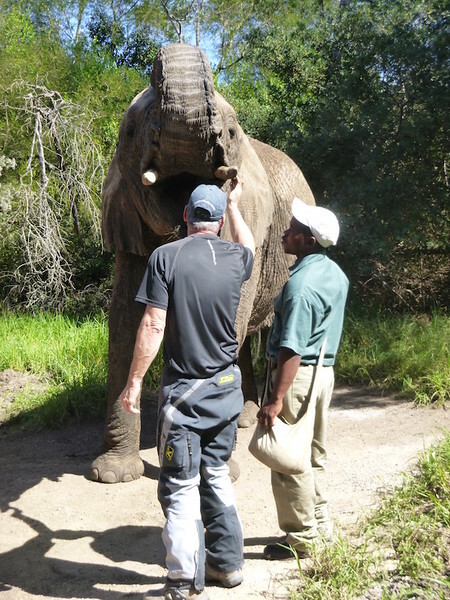 African elephants have larger ears. They use their ears as radiators and fans for body temperature control. The larger ears have more blood flowing through them to help cool it, and they flap their ears to help stay cool. They also roll around in the mud as a natural sunblock. 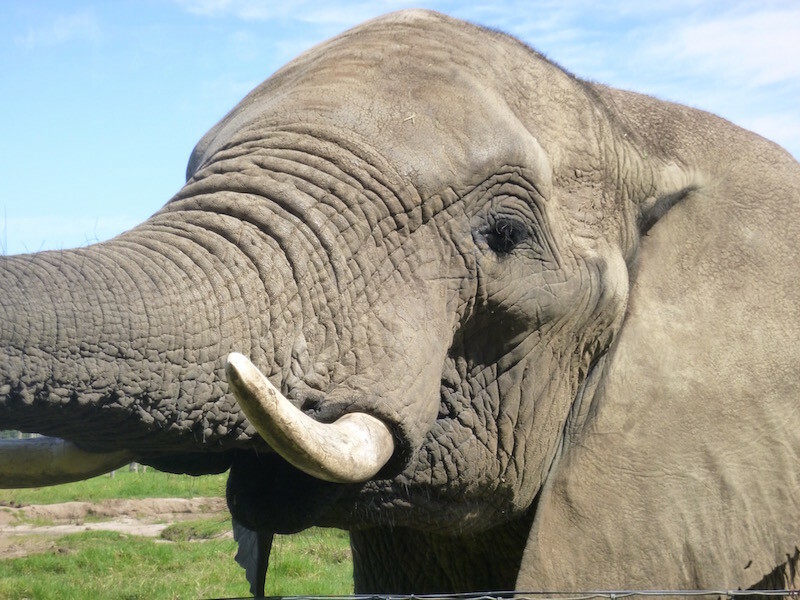 Did you know elephants only have four teeth: all molars, for chewing. But they go through six sets of these teeth in a lifetime. Also, elephants’ front feet are larger and round, because they carry more weight on their front feet than the rear. Two of the elephants I met at the sanctuary had lost the tip of their trunks. Normally an elephant has a couple of projections at the tip of its’ trunk that it uses like fingers to grab and pull grass up to eat. 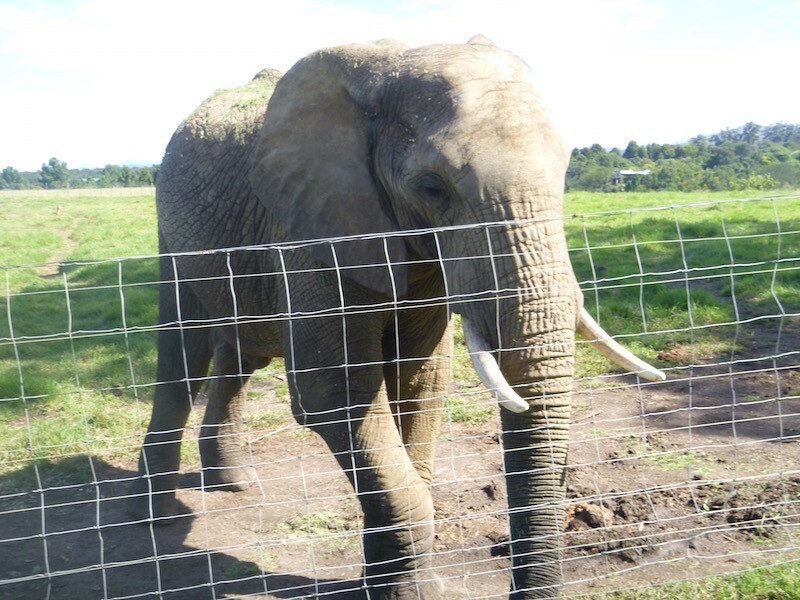 The two elephants that had lost this part of their trunks (the handlers at the sanctuary thought it had probably happened in a snare trap) had learned to use their feet to kick at the ground and tear the grass up before eating it. 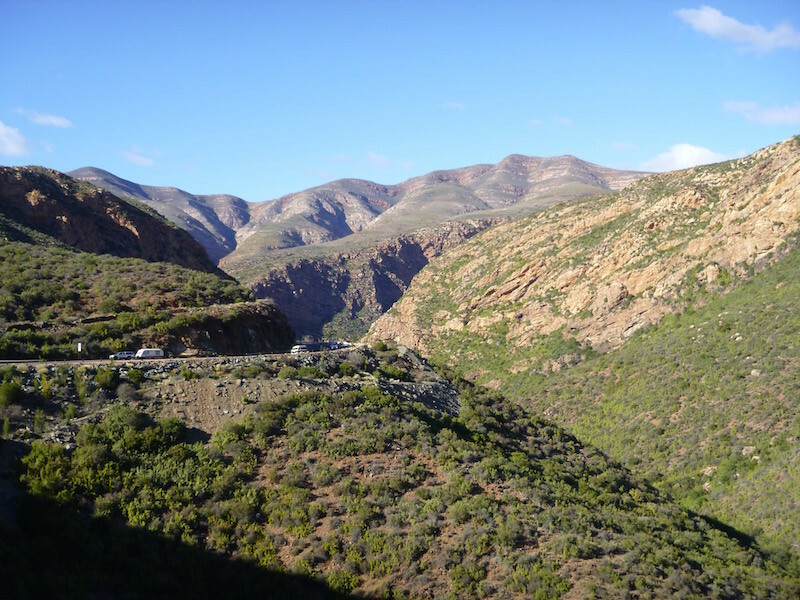 After leaving the elephant sanctuary, I headed inland, over the Outeniqua Pass towards Oudtshoorn (“Ostrich Capitol of the World”) and the Klein Karoo, or Little Karoo. Once through the pass, the scenery quickly changed from the lush green coastal landscape to arid semi-desert. 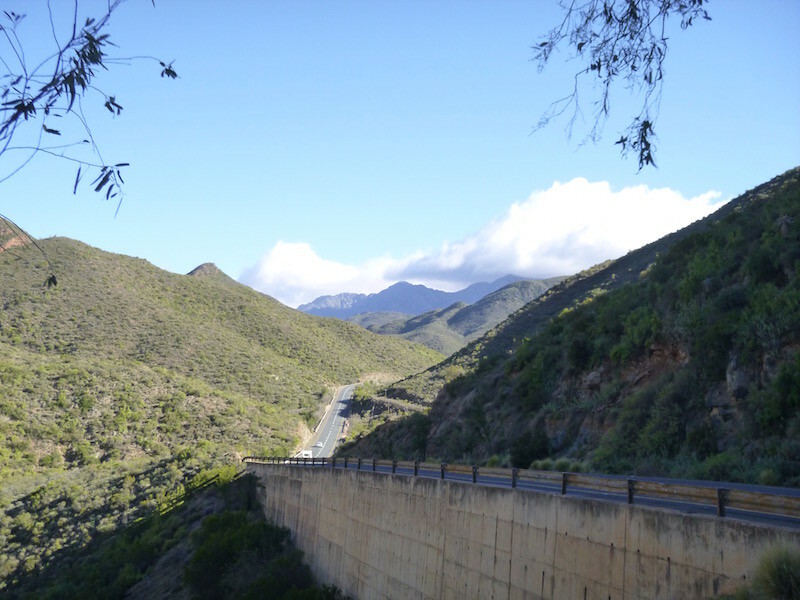 At Oudtshoorn I turned back west on Route 62, which is South Africa’s version of our Route 66, and much of it looks like Route 66 through New Mexico or Arizona: red rock bluffs, high desert scrub, and a long two-lane highway. 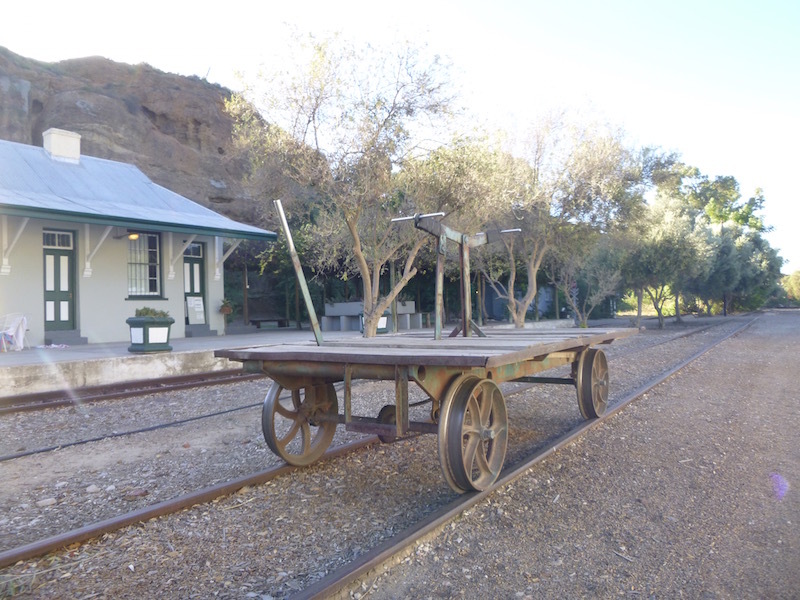 I camped at the Station Inn campground, where Cheryl and Michael have converted the old Calitzdorp railroad stop into a campground and pub. 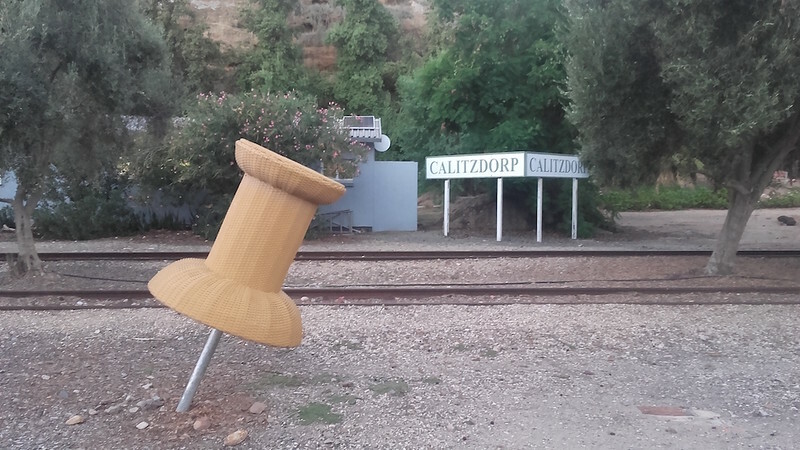 I entered the coordinates for Calitzdorp into my GPS and then rode until I saw the pin. Yes, the trolley cars function, and you can take one and go to the end of the property on it. I was the only one at the campground this night. Across the tracks from the old ticket office is an old warehouse that Cheryl and Michael have turned into a pub and party hall. 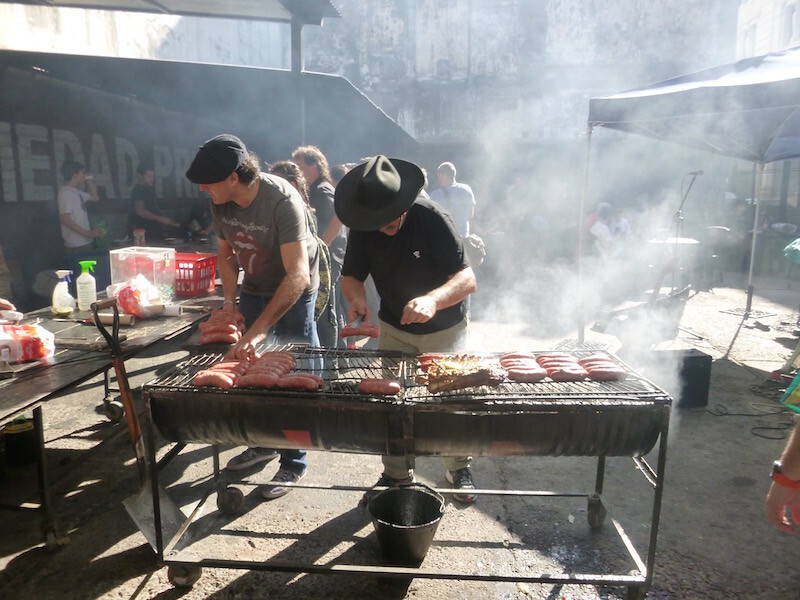 I was the only camper, though several locals showed up to play darts at the pub, and I spent some time talking with the owners about my travels, their travels (Michael has a BMW 650), and other travelers who have come through. The next morning I continued northwest on Route 62, and once again the winds picked up, causing me to fight for lane position again. By the time I reached N2 (the main highway to Cape Town), I was exhausted and my back, shoulders and neck were aching from straining to hold the bike on course. I had one more pass to cross before I would hopefully be out of the strong winds and back on the Cape Town side of the weather. Near the top of this pass is the Hugenot Tunnel, a 4 km long tunnel through the mountain. As I had hoped, the wind on the other side of the tunnel was just a slight breeze and things returned to a more relaxed ride, even though the pace was still much faster than I would have liked. 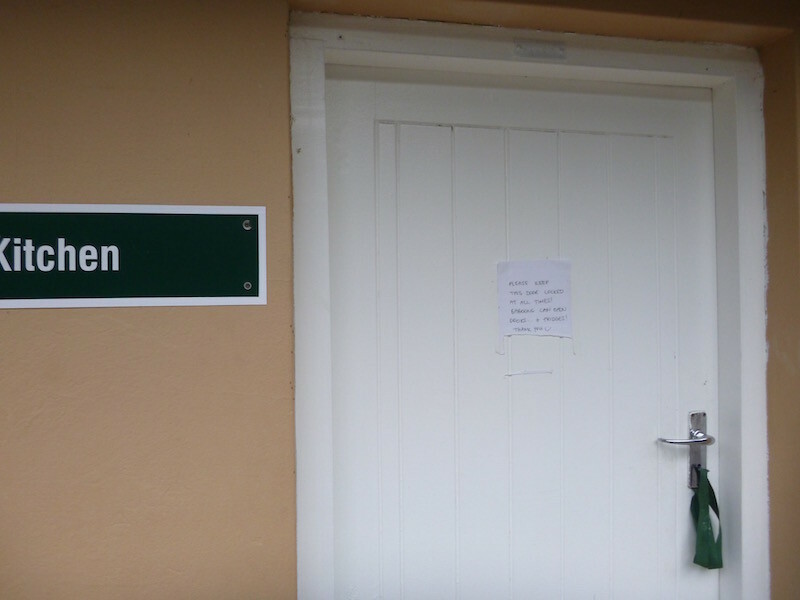 As I finished packing to leave the Backpacker Hostel in Agulhas, a gentleman approached me and asked some of the usual questions: where was I headed, where did I come from (which typically starts a much longer conversation when they realize that i rode 35,000 kilometers on a 250 to get here). Within a few minutes, his family joined him; it’s often the “I sold my house, my car, and most of my belongings before leaving on this trip” that gets the wife interested. Suddenly, it’s not just about motorcycles any more. Once again, South African kindness prevailed, and before leaving, Mrs. Charda gave me a slip of paper with their phone numbers on it and asked me to call them when I returned to Cape Town and she would cook an Indian dinner for me. Nearly the entire day was spent on major highways, which I hate. 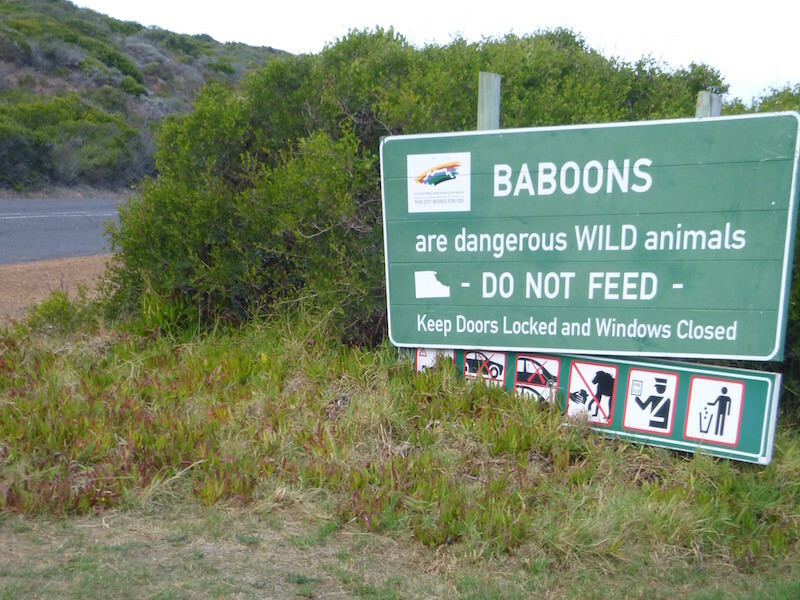 But the N2 highway is the coast road along this section of the Garden Route, so I had no real choice. The speed limit here is 120 kph (about 74 mph) in many places, and that’s faster than the XT likes to go. I felt bad pushing it at 100 kph for any extended period, but with all of the Easter traffic returning home today, I had to get out of the way. This is the first time of my entire trip that I’ve felt I was going slower than the majority of the traffic, and it’s an indication that I’m not on the roads I want or like to be on. In South Africa, it’s common to pull onto the shoulder to let faster traffic pass (much like in Texas), and here nearly every car that passed me, including a police car, turned their flashers on for two or three flashes after passing as a “thank you”. Speaking of road customs, I hadn’t really considered it until today, but motorcyclists here have a bit of a difficulty with being friendly. In the States, it’s very common for two bikers to “wave” at each other when they pass on the highway. This is done by extending the left hand out to the side and down slightly. In South Africa, that doesn’t work so well, since you’re on the opposite side of the road and the “wave” is on the wrong side. Of course, you can’t just take your right hand off the throttle to wave (unless you have cruise control, which is a small percentage of bikers). In France and Italy, when I would pass other bikes, they would hang a foot off the peg as a means of waving without removing a hand from the bars. Here in South Africa, they do this “head nod” thing: they kind of flop their head to the right side, like waving your head instead of your hand. It looks odd at first, but I caught on after a while. After a relatively long (450 km) day on the highway, I arrived at Natures Valley National Park, just outside of Plettenberg Bay. 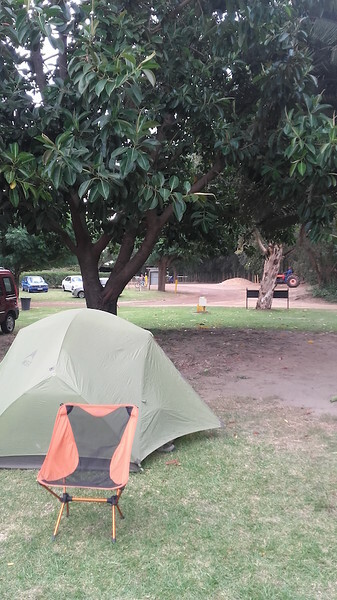 It’s a fairly small camping area, but nice, filled with trees, and baboons apparently. 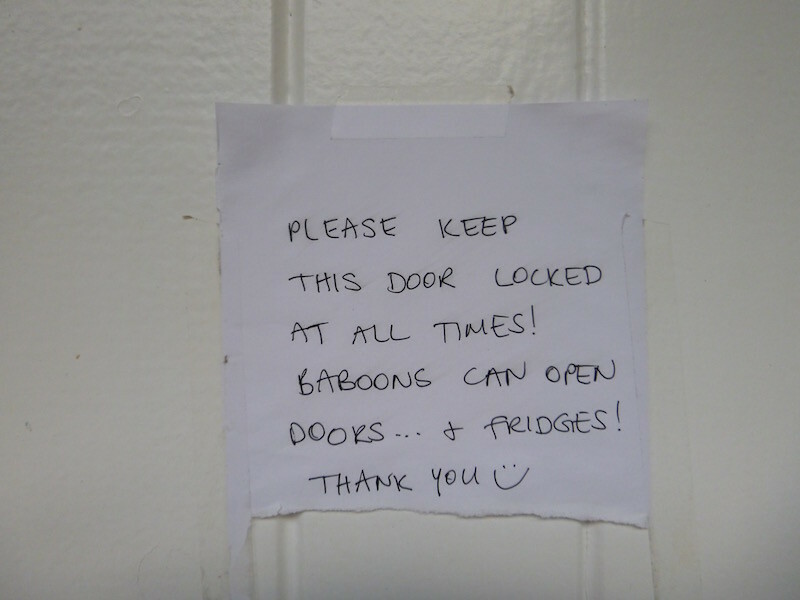 Sign posted on the door to the kitchen area at the campground. I didn’t see any, but I heard some odd noises during the night. My food stays locked in the panniers while camping here, just in case. Am I Back in Patagonia?? It poured down rain all night. I stayed dry in my tent, though for the first time I had a little drip where the fly and tent touch the main pole. It stopped after a bit and never really became a problem. I slept really well, other than occasionally having to peek outside to make sure the river wasn’t rising too fast. I knew when I went to bed it was about four feet lower than my tent. It rained a bit over an inch during the night. So I didn’t float away. It continued to rain on and off until about 10am, when the sun peeked through the clouds long enough to dry the rain fly and footprint of my tent and get everything packed. 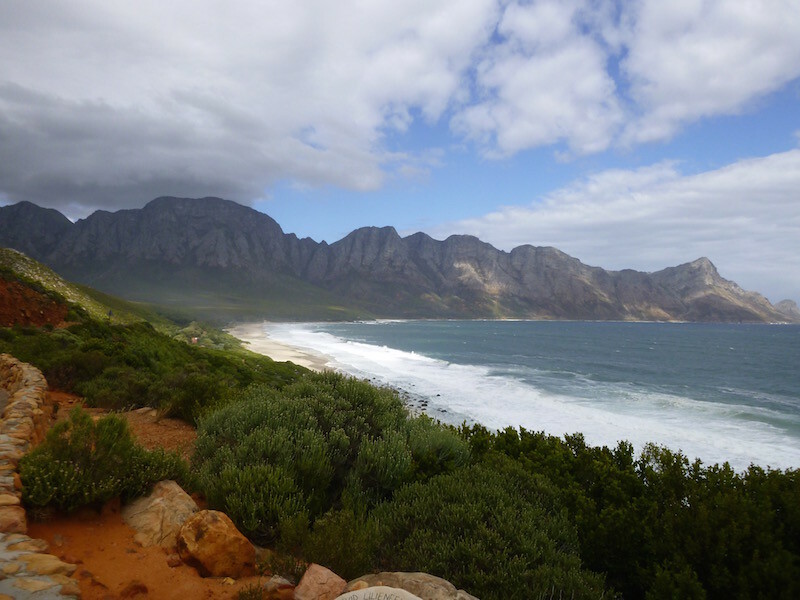 I headed for the coast, to the town of Strand, then followed the coast road to Betty’s Bay and Hermanus. 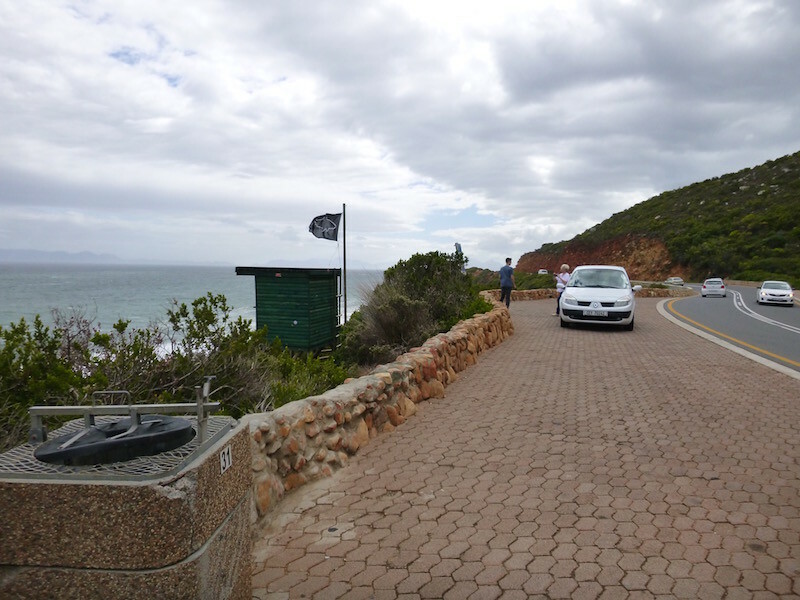 The road to Hermanus from Strand is another one of those epic coastal roads, just hanging there over the ocean. With the front that blew through last night, the wind was howling and the seas were really churning. Waves looked like they would crash and stop, the wind forcing them back and not allowing any further forward progress. Like Chapman’s Peak, this is a road I could ride several more times just for the scenery. The coastal route runs right along the edge of the mountains here. Spectacular! Not sure if the black flag with the shark on it is truly a shark warning for surfers, but I don’t want to find out. 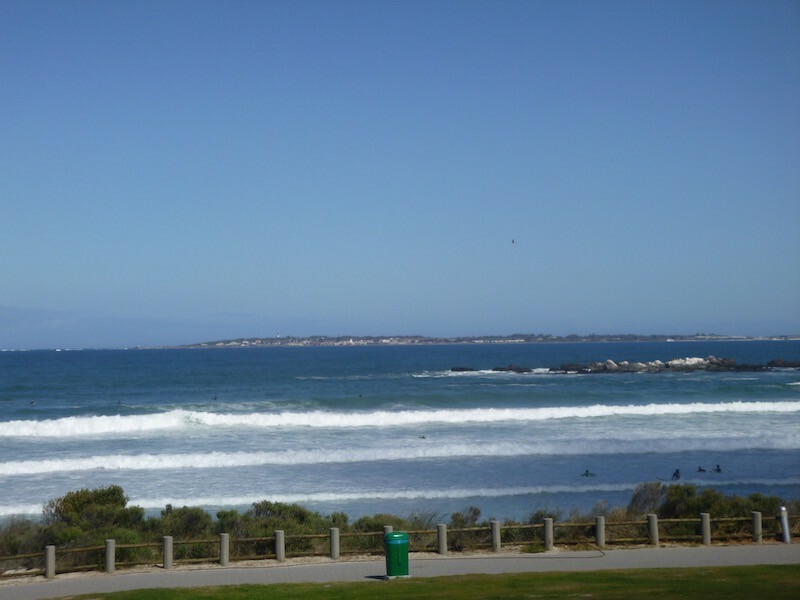 Beyond Hermanus I turned inland and really fought the wind. At one point I found myself fighting hard to stay on the road at 28mph. Any faster and I couldn’t keep the bike in the lane. A large dust storm blew across the road for about a mile, reducing visibility and making it feel like the front tire would slip out from under the bike at any moment. It was worse than anything I had experienced in Patagonia. 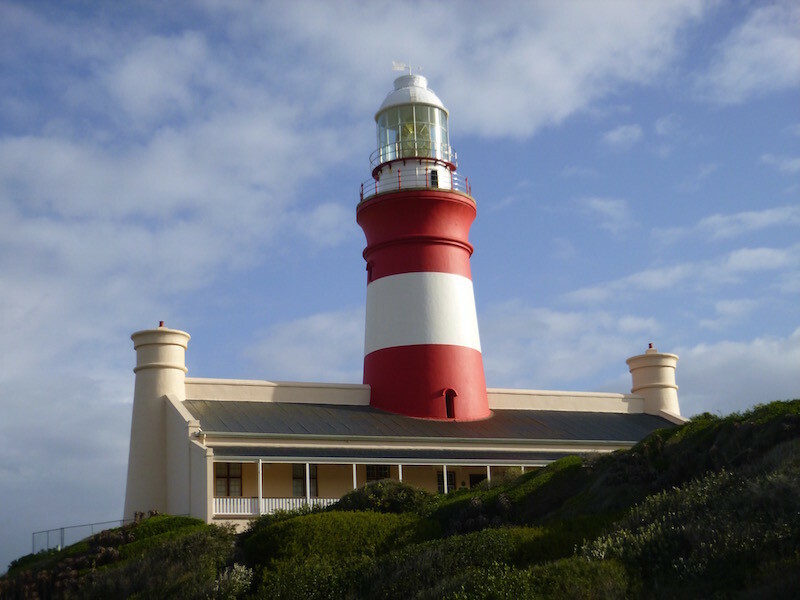 Eventually I made it to Cape Agulhas, although I have to admit that for the last ten miles I was seriously questioning if it was worth it. 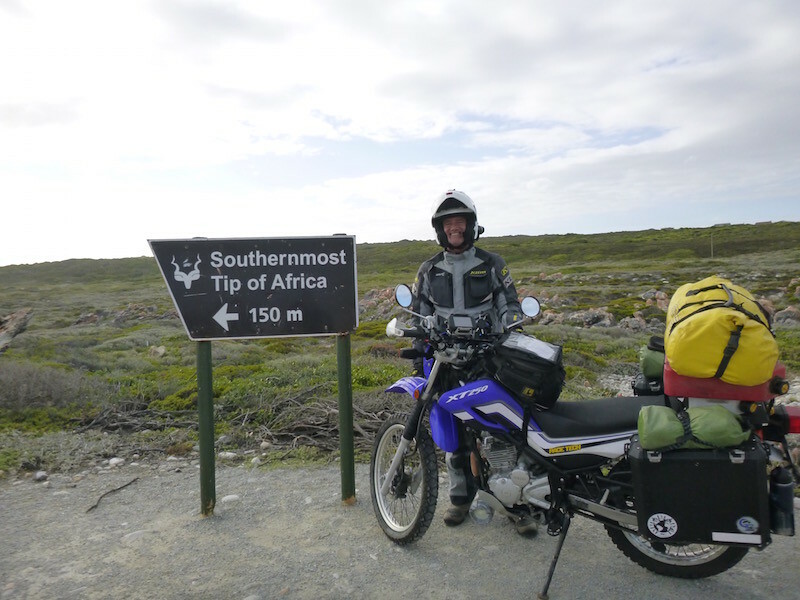 The whole reason to go to Agulhas is like going to Ushuaia: it’s the furthest point south on the African continent, and of course I just had to have the photo. But getting there made getting to Ushuaia look easy. It’s not always like this here; I just picked the worst possible day, just after a strong front passed through. Ok, that’s it for “south”. Time to start heading north. 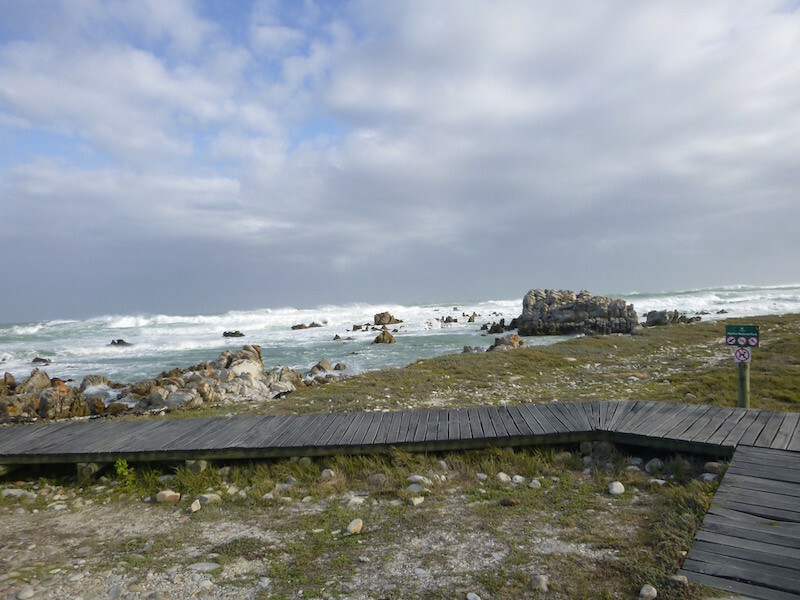 I had planned to camp at a caravan park in Agulhas but it’s just a big grass lot a block from the ocean, and I was afraid the wind was too strong for my tent, so I began to look for a place to stay. Unfortunately it’s Easter Sunday, and everything in town was booked. I stopped at several places, and at one the couple who own it called around for me, confirming that nothing was available. Ugh. Into the wind….always point it directly into the wind, not at an angle. While waiting for the couple to check on alternative lodging for me, the wind managed to blow my bike OVER the kickstand and onto the ground. First time I’ve had that experience. I knew when I parked the bike I should have pointed it into the wind, but at the time there was a lull and I thought I could make it. I resigned myself to trying to pitch my tent at the caravan park. When I got there, it was closed, and there was a sign that said their Sunday hours were until noon, and listed an after-hours number to call. I fished my phone out of my pocked and started to dial, but before I could finish a woman walked up and asked if I was looking for accommodation. Well, that decided it for me. I got back on the bike and rode back across town to the hostel. The guy at reception was very nice, showed me a great place to put my tent with good wind protection, and gave me a tour, including all the amenities available to me even though I was just camping. Hot showers, free coffee and tea 24/7, swimming pool. All for 80 Rand, or five dollars. The wind is supposed to die down tomorrow. I hope so. I’m not sure I can get out of this town otherwise, as it will be worse heading the other way. Tomorrow will be a long day, with or without the wind, but I’m looking forward to more spectacular scenery. And I’m only a couple of days away from large animals! It’s Easter weekend, and while summer has just ended, it’s a holiday (think Labor Day at the end of summer in the U.S.). 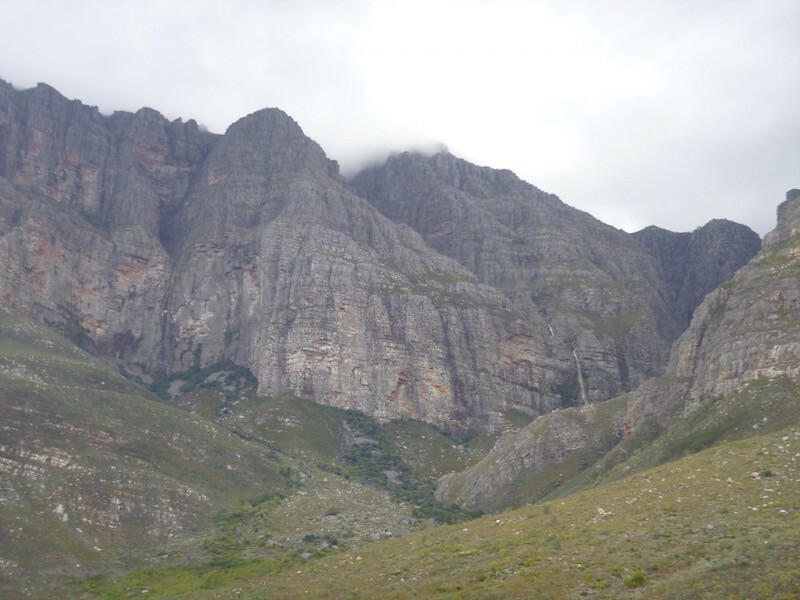 I’m headed first to Franschhoek (Afrikaans for “French Corner”) and then to a campground on the river for my first night in the tent in Africa. 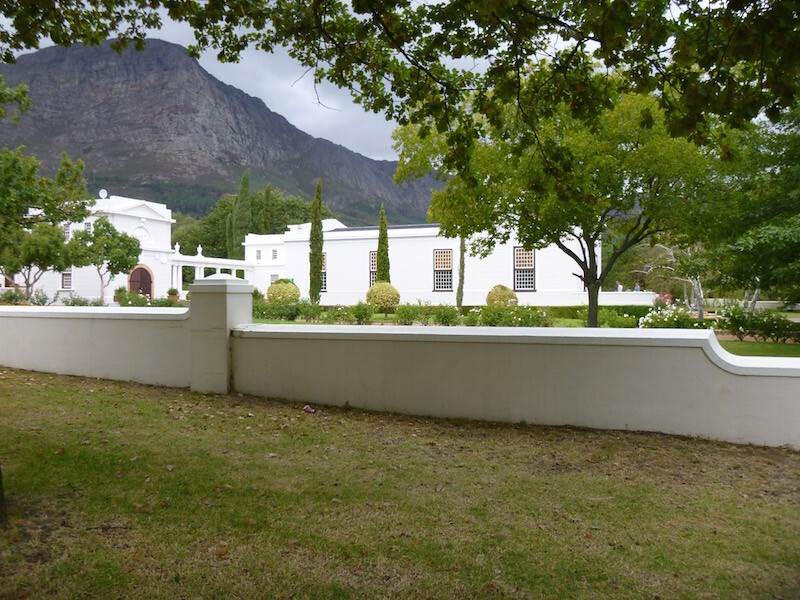 Franschhoek is less than an hour from Cape Town. Nestled between mountains in a beautiful valley, the road there is lined with vineyards and wineries for miles. It seems like every few hundred yards is an entrance to another winery. They all have beautiful large Provencal looking buildings. It definitely feels like I’ve arrived in Provence. It’s a town of only 15,000 residents, but it swells on weekends and holidays. 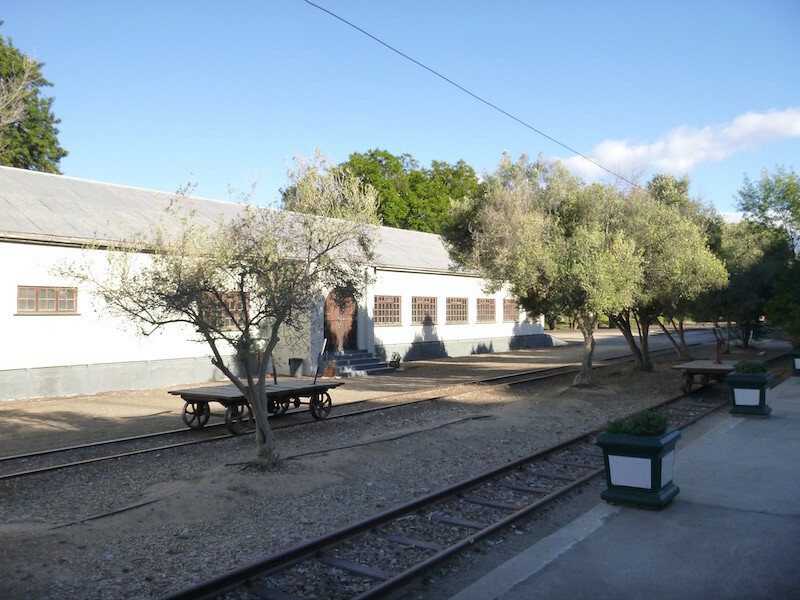 Huguenot museum in Franschhoek. 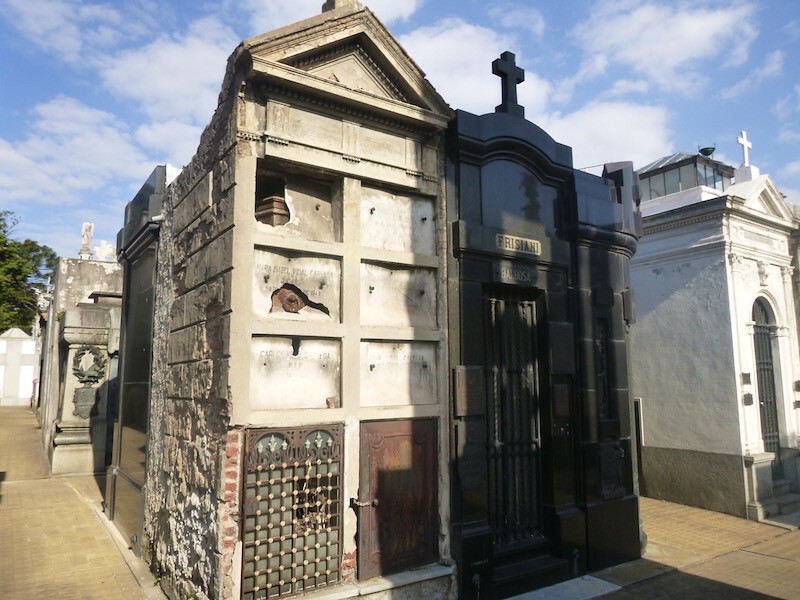 Huguenots were French protestant refugees in the 16th and 17th centuries who settled here after fleeing religious persecution in France. 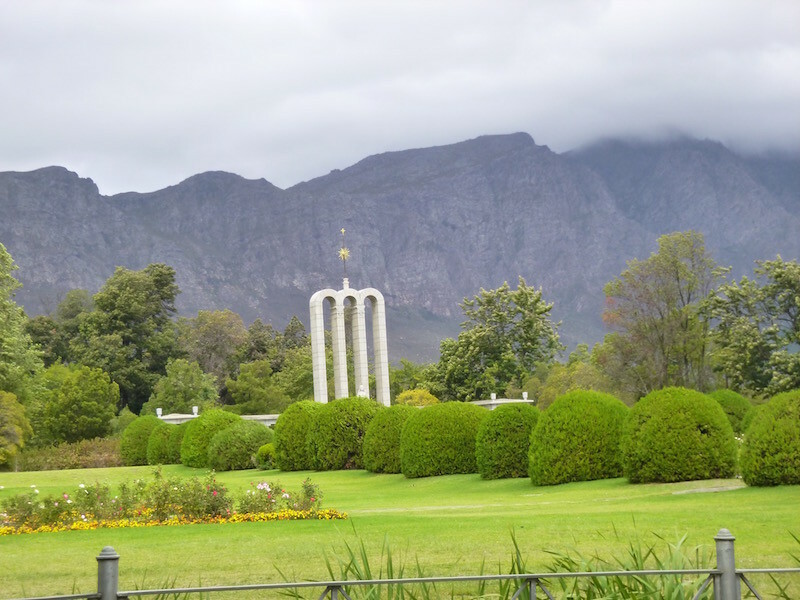 Just before riding into town, I spot the Franschhoek Motor Museum on the opposite side of the road, and turn around to take a photo. I really wanted to tour this museum, but I visited their website and found that while their collection includes antique cars and motorcycles, motorcycles are not allowed on the grounds. Seemed very hypocritical to me: “If you are a true motorcycle enthusiast, you would surely appreciate our collection of rare motorcycles. But you are not welcome to view them. However, if you arrive in a car and have no interest in motorcycles, feel free to have a look.” I even sent them an email explaining that I had ridden my motorcycle around the world to see their collection, and received no reply. 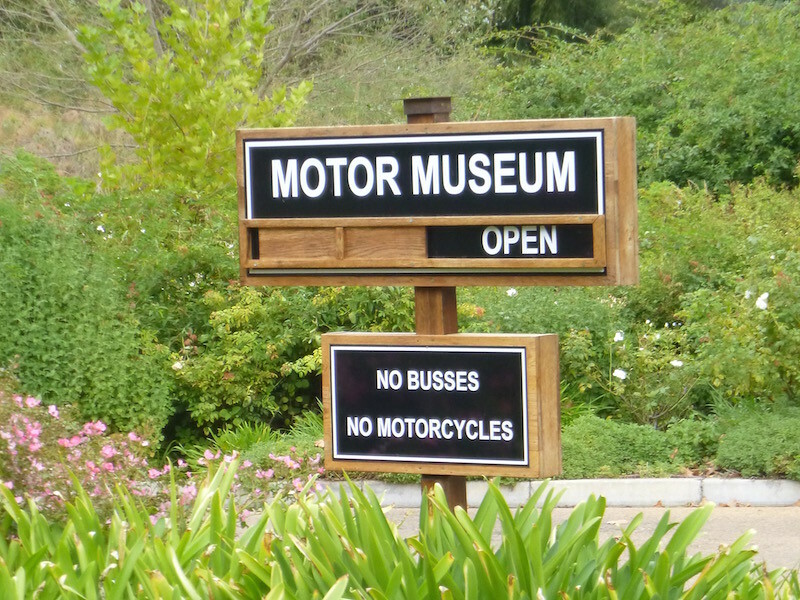 No motorcycles allowed to visit this motorcycle museum. I rode through Franschhoek all the way from end to end twice. It’s a small town. A beautiful, but touristy, small town. I quickly noticed that I was the only motorcycle in town. After seeing tons of BMWs all over Cape Town, I thought sure I’d see a few here, mixed in with the occasional vintage Rolls Royce and Mercedes that I saw easing down the main street. Perhaps Franschhoek is just too snooty to accept any motorcycles. After two passes through town, and not finding a parking spot within viewing distance of a sidewalk cafe, I decided to ride on. I’m sure the parking lots off of the main street are safe, but with all of my gear on the bike i just didn’t feel right walking away from it. In other places in both South America and in Cape Town, I simply pulled over the curb and parked on the sidewalk (no reason for a bike to waste an entire car space), but here it just didn’t feel right. After a late lunch I headed towards the campground I had found on iOverlander.com. It’s Easter Saturday, and I was afraid I might not find a space for my tent, so I figured mid-afternoon might be better than waiting too late. 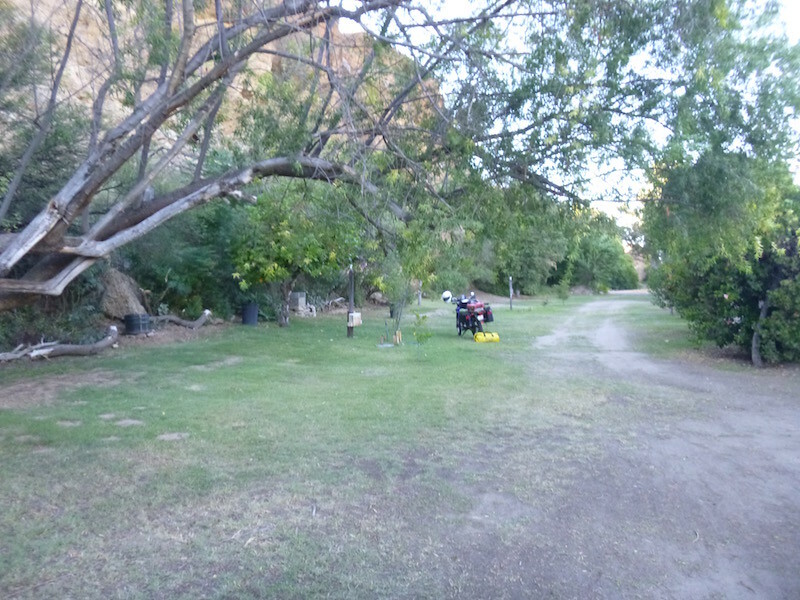 When I arrived at Berg River Resort, I asked if they had a spot for my tent. What is with this country?? After a brief discussion, I agreed to their terms. It turns out, my campsite (the last one they had) is in direct view of the gate and only about 100 yards away. It took three trips to haul my gear from the bike to the campsite. As I was covering the bike, two guys in a loud small car came through the campground. If it’s the noise that made them prohibit motorcycles (and I don’t know that’s the case, but I suspect it is), then the Honda Civic just proved that point wrong. Hard to see, but three trees back, you can just see my blue motorcycle cover. That’s the entrance to the campground, and as far as motorcycles are allowed to go. 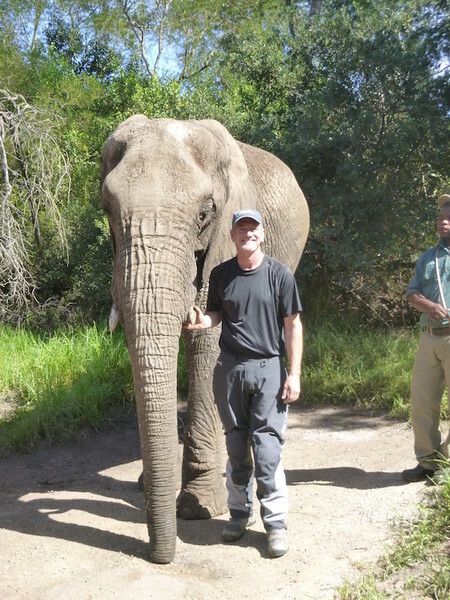 I had expected to be denied access to the National Parks in Africa due to safety concerns with the wild animals. I was not expecting to be denied access to motorcycle museums and campgrounds. Still, this is the only real negative I’ve found so far in South Africa, and it’s offset by the tremendous kindness that continues to arise from total strangers. Like tonight: as I was about to fire up my stove to cook my now standard pasta-in-a-mug dinner, my neighbors at the campsite, Franz & Christie invited me to share their dinner, which was way better than my pasta…rice and veggies stir fried with ostrich meatballs. After dinner, Franz pulled out his Africa Road Atlas, turned to the South Africa section, and began circling roads and places that I should see. Then he gave me the book! I couldn’t believe it. It includes nearly all of the countries I intend to visit. Inside the cover, they wrote their phone number, and told me to call them if/when I got to Mossel Bay and I could stay with them. 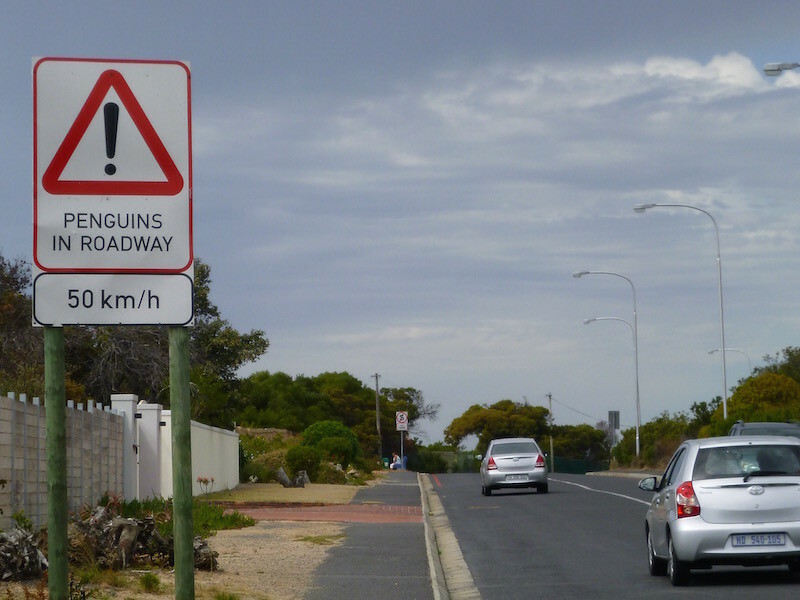 Unfortunately, I may pass through Mossel Bay before they even return home from the campground, but if the timing works, I intend to take them up on their invitation. 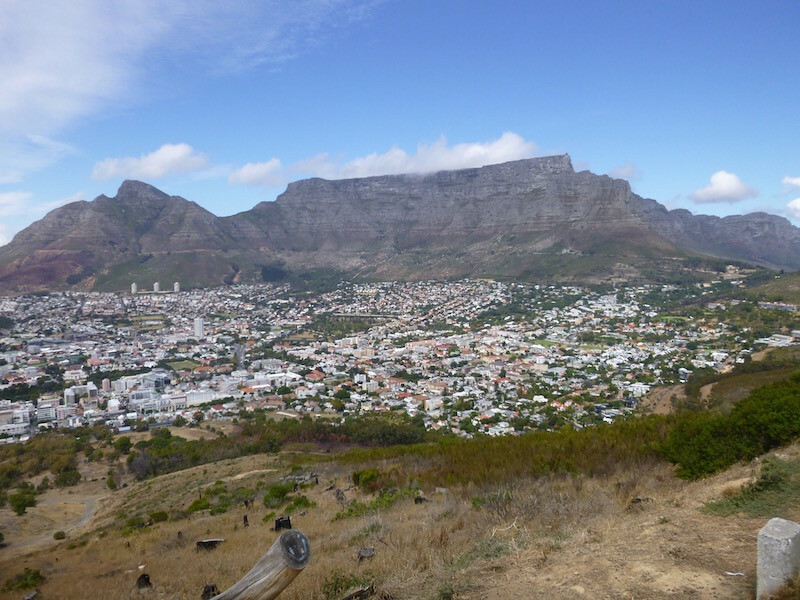 Yesterday I tried to go to Table Mountain and ride the aerial tramway to the top for a look around. Unfortunately, the wind was blowing like I was back in Patagonia, and the Tram was closed due to weather. 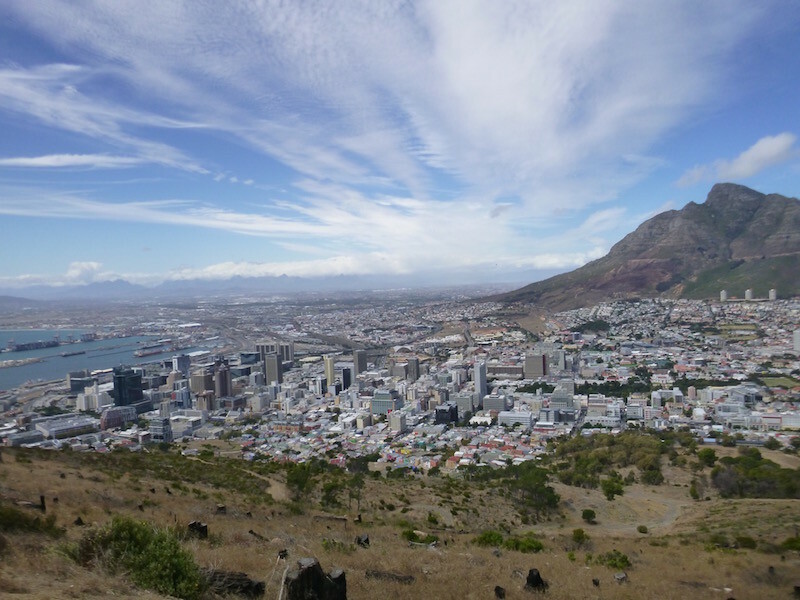 So instead I rode up to the top of Signal Hill, which is near Table Mountain, and took in the views of the city from there. Looking across at Table Mountain from Signal Hill. 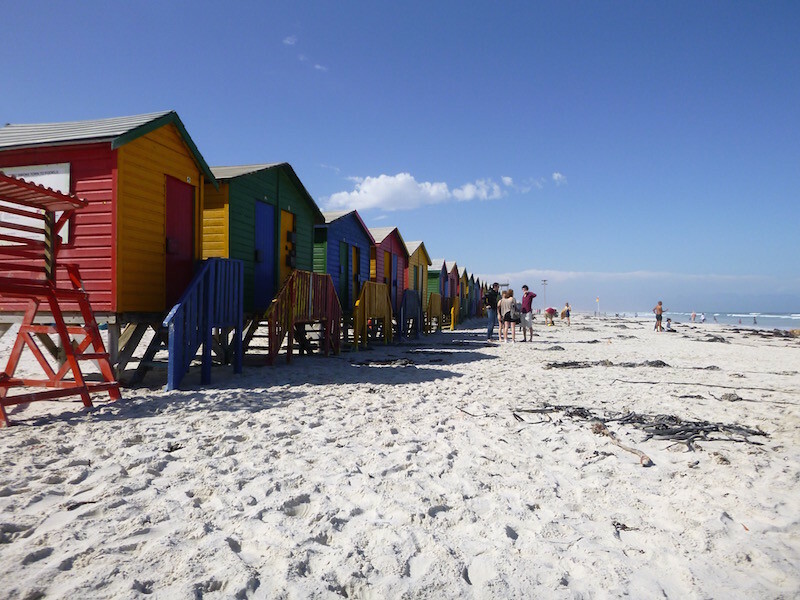 Today I played tourist and ticked off a bunch of places to see and things to do on the Cape Peninsula south of Cape Town. I started by heading towards Table Mountain again. After checking their website, I decided to pass on the cable car ride to the top, for two reasons: first and foremost, today is a holiday, and there are tons of people there; the website said there was a two hour wait at the bottom to board the tram. 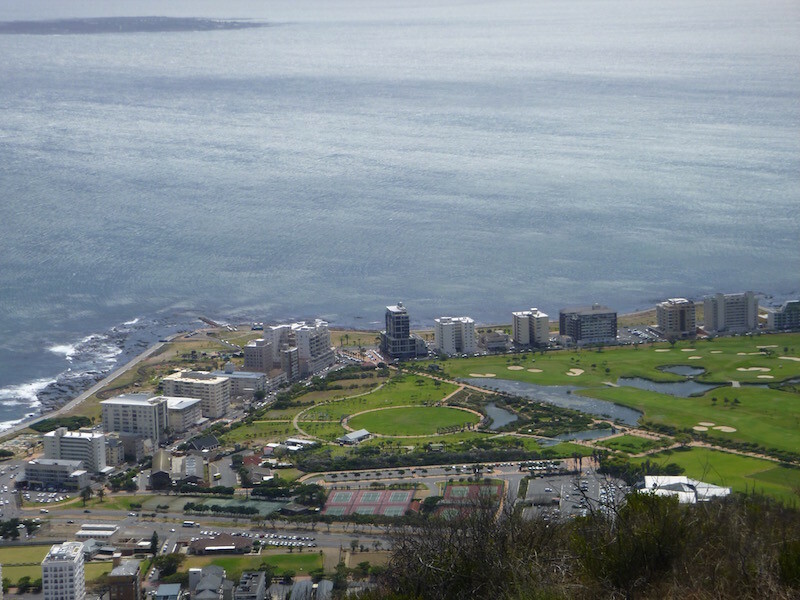 Second, it’s a bit pricey at 240 Rand, or a bit over $15, just to get a view of Cape Town from higher up. Yesterday I rode to the top of Signal Hill and the view from there was good enough for me. 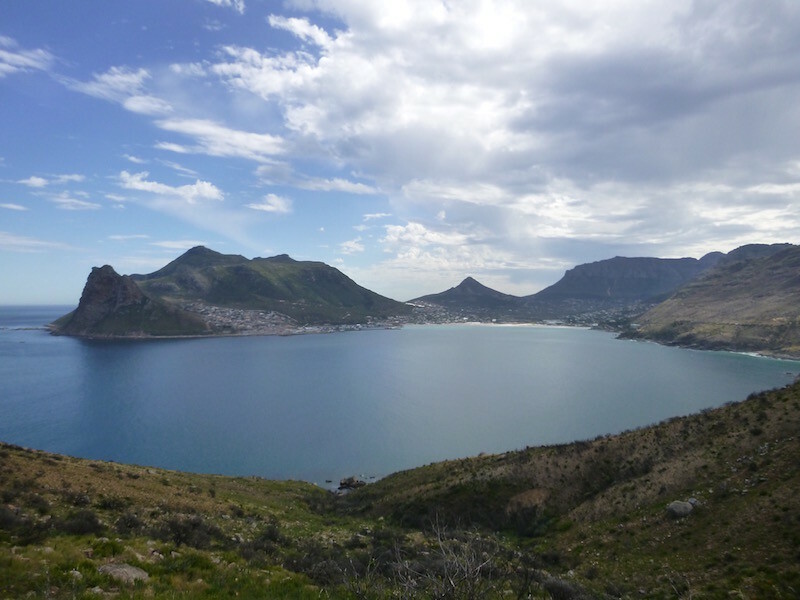 So instead of going to the west side of Table Mountain, I rode down around the east side, and then around to Hout Bay. The traffic this morning was a bit worse than normal due to the Two Oceans Ultra-Marathon that is taking place tomorrow. As a warm-up, there were several different “fun runs” this morning. Several roads will be closed tomorrow, and all along my route today I saw television cameras being set up on platforms alongside the road. I’m thankful that I was able to do this trip today and didn’t accidentally stumble into that mess tomorrow. It was cool to meet someone randomly in traffic from “home”. I didn’t get to speak to them for long, but it appeared that perhaps they were here for a bit longer than a week’s vacation. 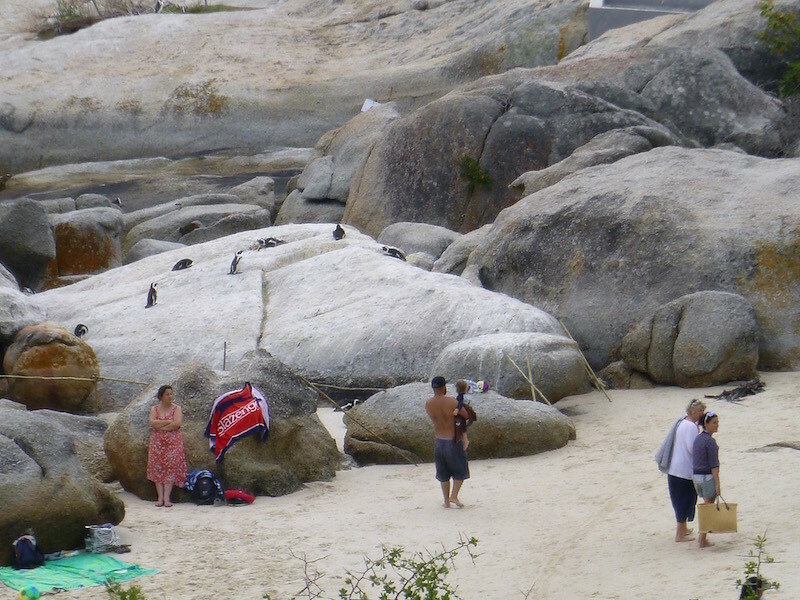 Beautiful beach at Hout Bay. 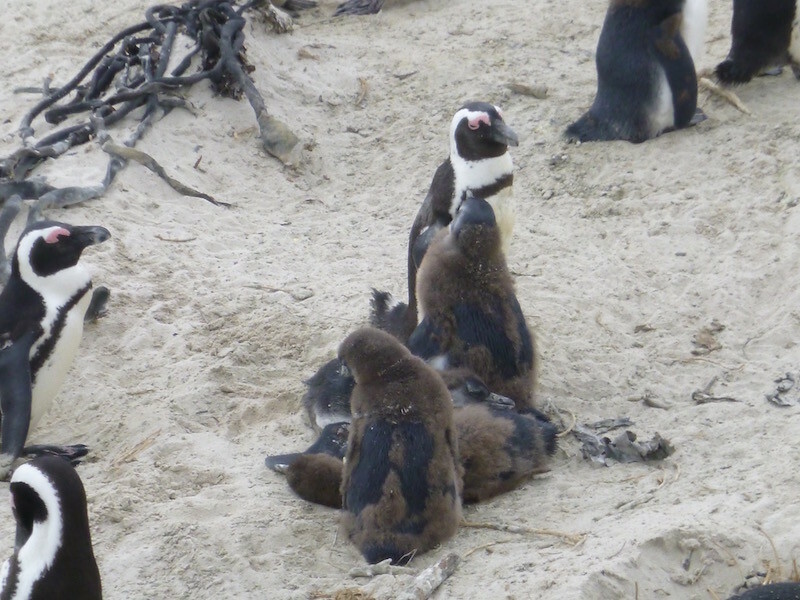 There’s a small island just outside of Hout Bay with a large colony of Cape Fur Seals. You can take a boat ride to the view the seals, and it’s relatively inexpensive. I would have done it, but between the marathon crowds and the holiday weekend crowds, I decided to skip it. I plan to see a lot more “fur” later on in Africa. 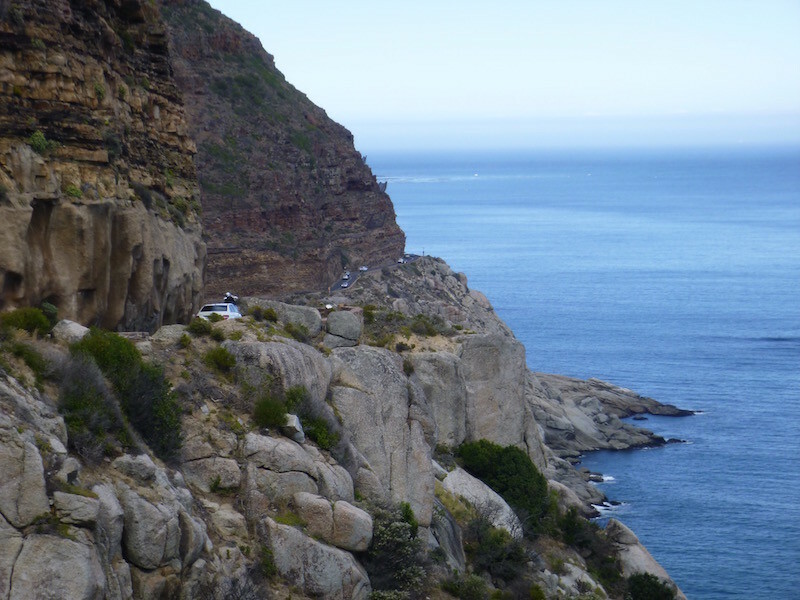 Just past Hout Bay is a spectacular road along the coast called Chapman’s Peak Drive, or simply “Chappie” by the locals. 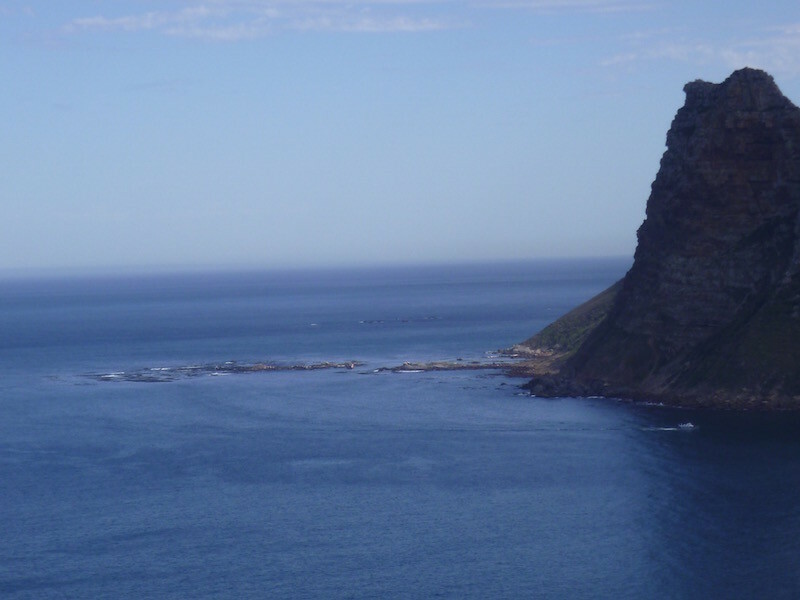 Chapman’s Peak Drive. Spectacular road and scenery. 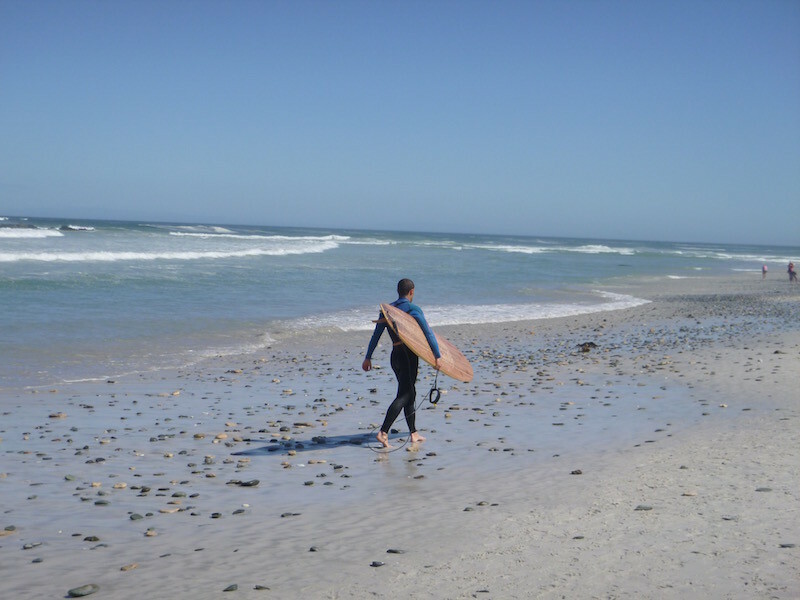 Chappie ends at the town of Noordhoek on the south end. 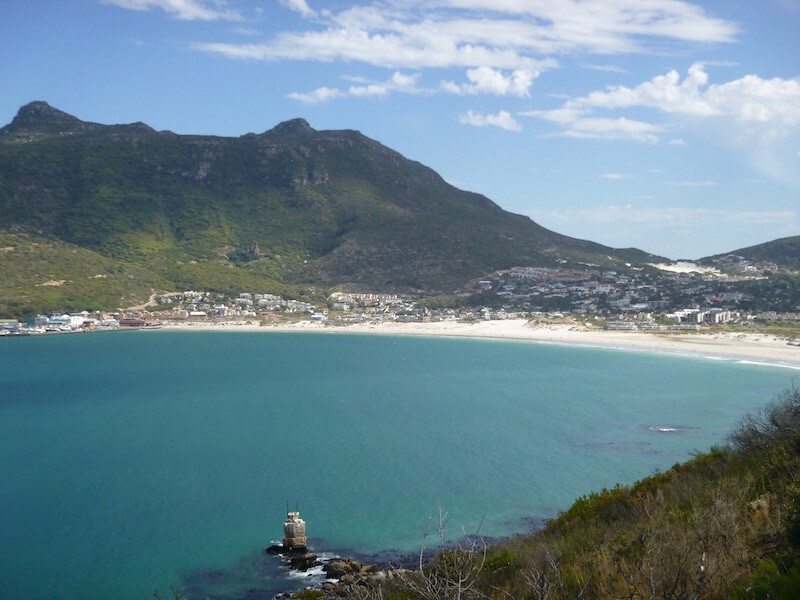 From there the road splits, and I chose to head further south to Scarborough before turning east and cutting across the peninsula to Simon’s Town. Toto, we’re definitely not in Kansas any more…and by the way, how do I roll up my windows and lock my doors on this bike? Yep. Not Kansas. Or Texas. 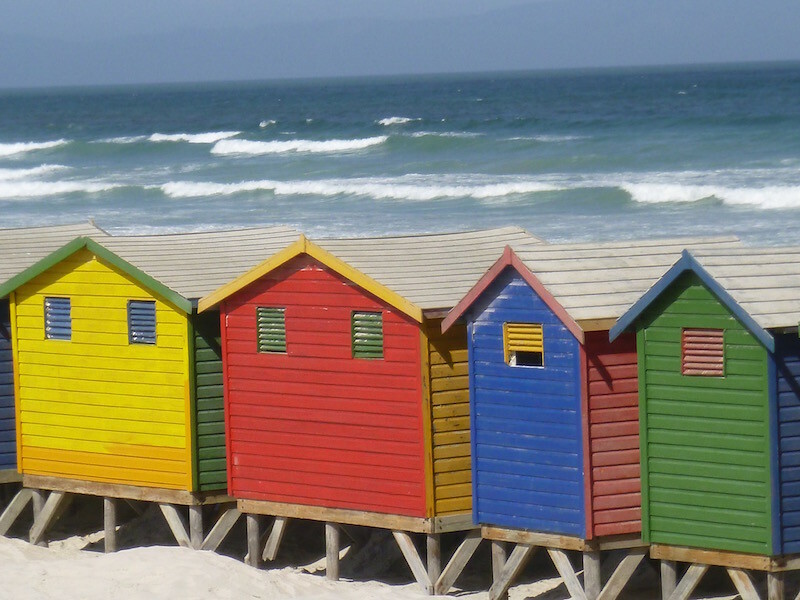 Simon’s Town is a quaint little seaside village that has become quite a tourist draw. 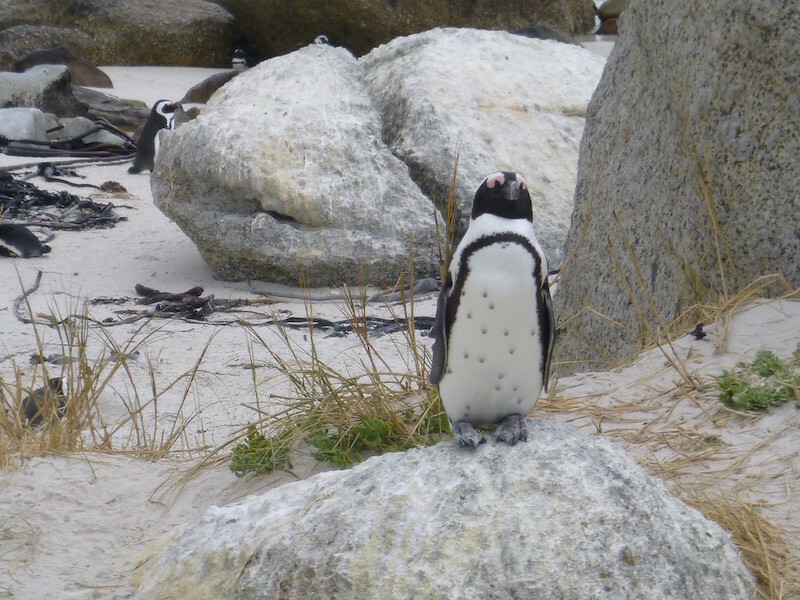 The South African Navy is based here (both ships, from the size of the harbor…just kidding), and just south of Simon’s Town is Boulders Beach, which is home to a colony of 3,000 African Penguins. 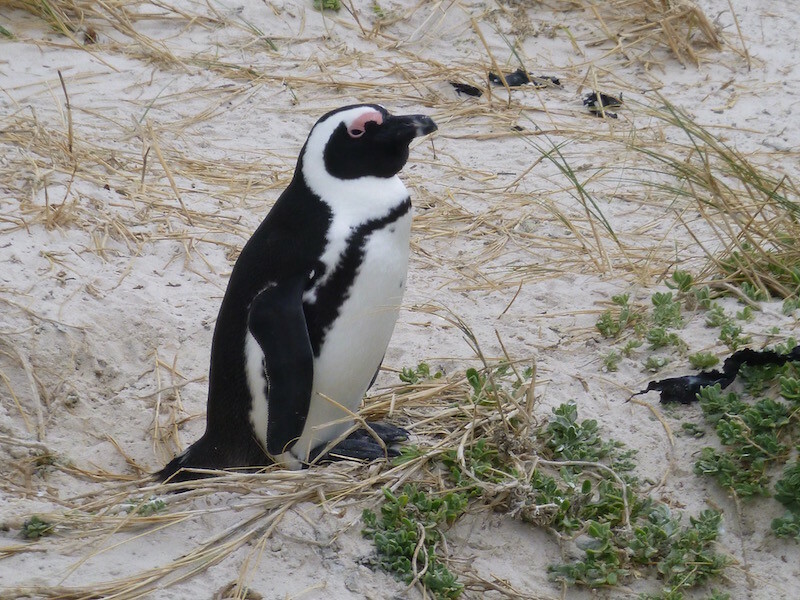 These penguins used to be called Jackass Penguins, due to the donkey braying sound that they make, but somebody decided they needed a more attractive name, so now they are known as African Penguins, and are the only penguins that breed in Africa. Penguins, on the rocks. Shaking, not stirred. Young ones, molting. 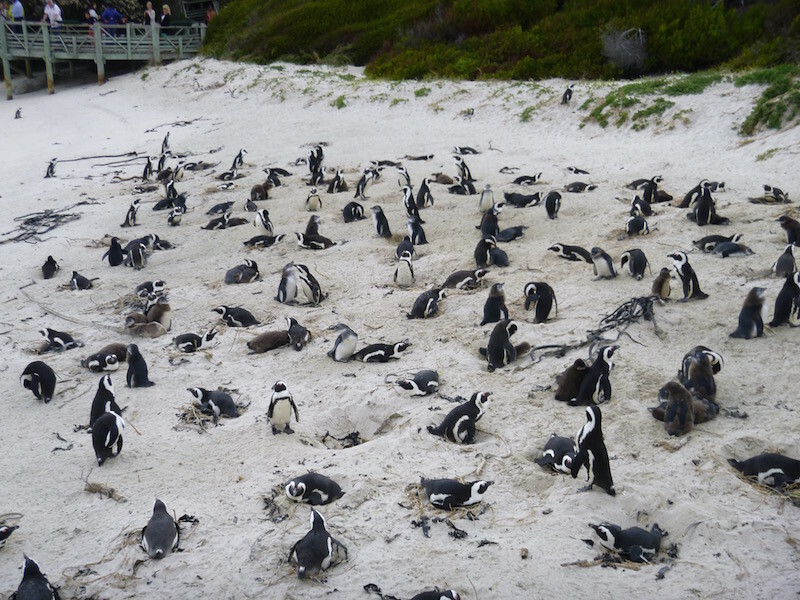 These penguins change their feathers once a year, and it takes 21 days to do it. During that time, they can’t go in the water, so they have to eat a lot before hand, then starve themselves for three weeks. 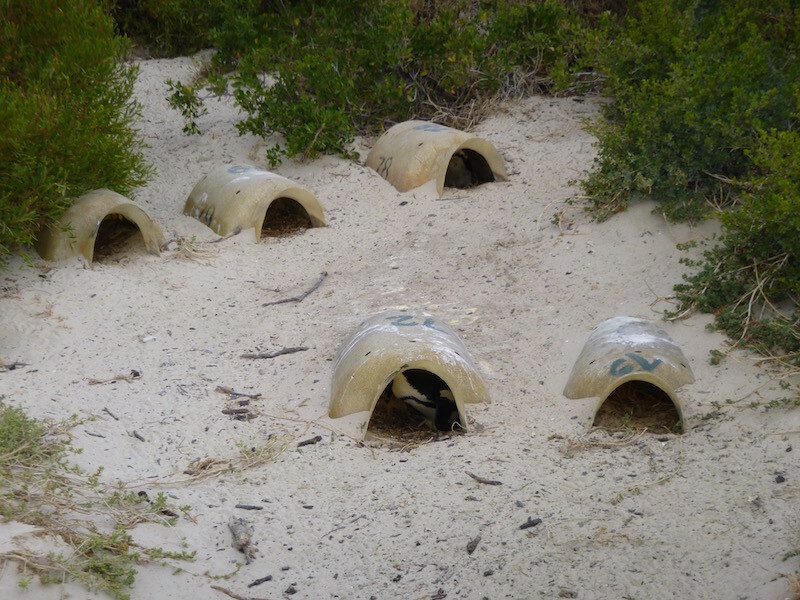 Unlike in Ushuaia, these penguins are provided fiberglass “nests” which they seem to have adopted without a problem. We had a brief conversation about my travels thus far, they wished me luck, and off they went. Heading back up the east side of the peninsula, I stopped at Kalk Bay for lunch at Kalky’s Fish & Chips. As I was walking to the restaurant, a couple walked up next to me. Lunch at Kalky’s: Prawns & chips, and a fizzy. 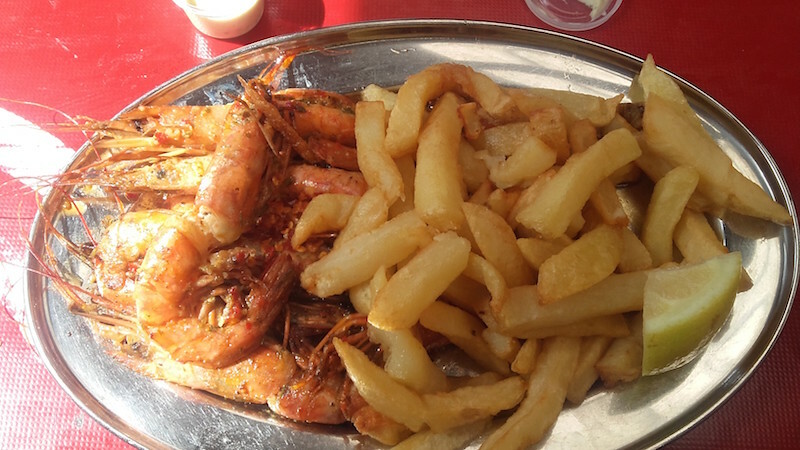 In the States, this would be shrimp & fries, and a soft drink. Very messy, very spicy, and very delicious. 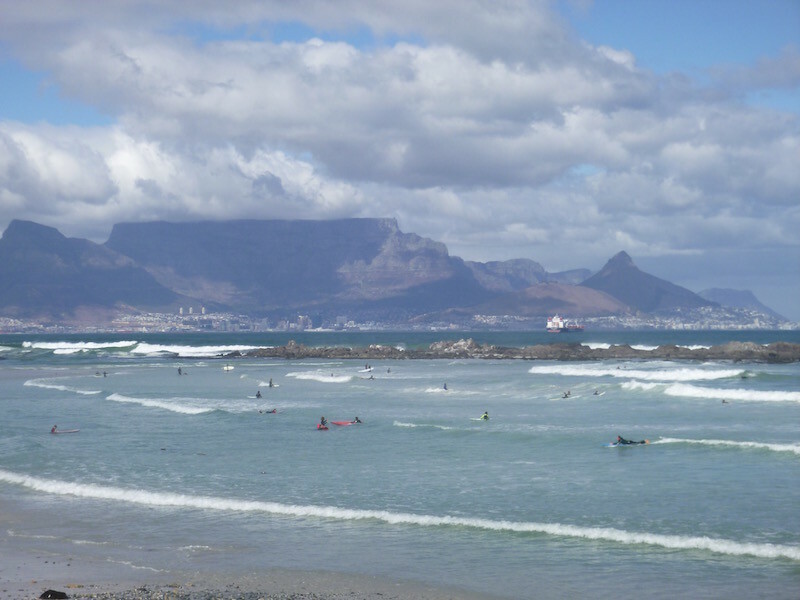 After a bit of clean-up, I was back on the bike and headed to Muizenberg Beach. Tomorrow I leave Cape Town for “greener” pastures. My bike flew into Cape Town from Buenos Aires via London yesterday. This morning I went to the airport to begin what I assumed would be a long process of getting the bike through South African Customs. I had set aside a couple of days for this process just in case, especially since I still didn’t have a title for the bike (it’s on its’ way; in South Africa now but hasn’t been delivered yet), and I wasn’t sure if I could get the bike released without the title. First up: find the bike. It arrived on a British Airways 747, but nobody, including Google, seemed to know the location of British Airways Cargo Services. I wandered the airport for a while, until someone pointed me towards South African Airways Cargo. It was a large building, so I thought maybe they shared it with British Airways. After going through their security checks and signing in, I was told that British Airways cargo was handled by Swissport, which was a few more blocks down the street. When I got to Swissport, they immediately knew my bike was there, and handed me paperwork and directed me towards Customs which was just across the parking lot. This is the point that I figured I was going to spend the rest of the day, and I fully expected to have to hire a customs broker in the end to complete the transaction. But I was determined to try to do it myself first and save the expense. To my surprise, the woman in the Customs office was incredibly helpful and very knowledgeable. She handed me another form to fill out, which I recognized as the form that a customs broker would normally complete. I took this as a good sign. She then asked me to sign a form giving Customs the authority to fill out my carnet de passage. For those of you who aren’t familiar with the carnet, it’s basically a form stating that you have put up money for a bond, and are temporarily importing the motorcycle and will take it back out of the country within a certain time limit or forfeit your bond. This is required in many countries, including most of Africa. I’ve been carrying it with me but hadn’t needed it until now. I signed the letter of authorization and she filled out and stamped my carnet. She never asked for any other paperwork for the motorcycle. At this point she and I walked back over to the Swissport warehouse together and she verified the chassis number of the bike, then signed the release form. Wait, what? That’s it? You mean I’m done? I can take the bike? Are you sure? Wow. Well, I did have to pay Swissport $18.95 for handling charges. But within two hours I had my bike and was free to go. No hassles. Very little waiting. It probably took me longer to get to the airport and find the right warehouse than actually walking the bike through Customs. “Me.” I waved my helmet at him. The grin on his face was huge. I’m not sure, but I think he was thinking, “This guy is crazy, and too old to do this.” Apparently I don’t look like a motorcyclist here. I haven’t decided yet if that’s a good or bad thing. I took the bike off the pallet, connected the battery, installed the mirrors, pulled my compressor out and aired up the tires, and I was ready to go. Slowly. Very slowly and cautiously. Because they drive on the left here. Which makes intersections, especially right turns, a bit tricky at first. Not too bad if you’re in traffic and can follow other cars, or when the street is well marked with arrows painted on the lanes. Without all of that, it requires a bit of extra concentration. As I approached the first roundabout, I was constantly repeating “LEFT! CLOCKWISE! !” in my helmet. I know from past experience riding in England that it will quickly get easier. 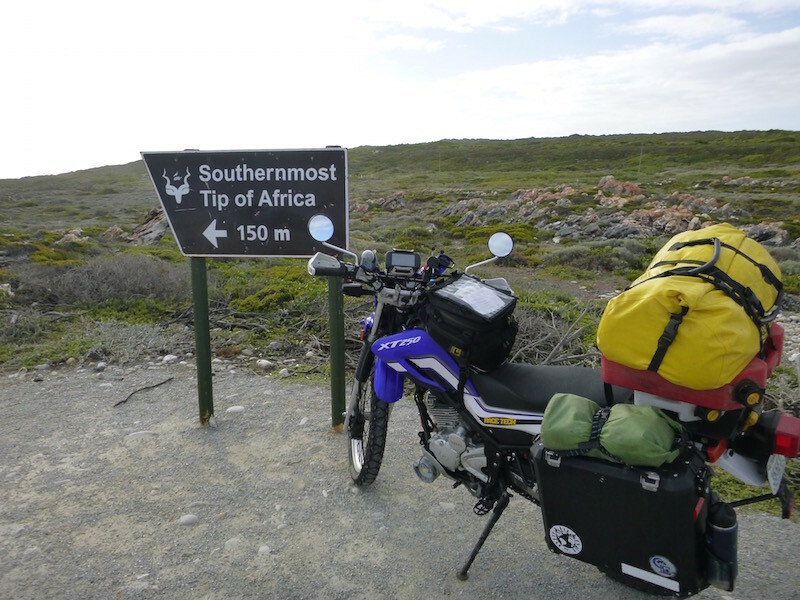 I’ll spend the next few days sight-seeing around Cape Town and prepping the bike, then I plan to head along the coast for a few days, camping and visiting some of the spectacular spots in South Africa. It’s all coming together. Feels like Southern California (temperature and neighborhoods), looks a bit like Honolulu. That’s Table Mountain in the background. I’m headed there tomorrow. More details on that later. I couldn’t decide if this guy’s board was really wood, or just fiberglass made to look like an old-school wood board. It has grain and knots and the whole bit, but I’m pretty sure it’s fiberglass. Looked cool though. Cape Town’s version of Alcatraz: that’s Robben Island in the distance. Originally a leper colony, later a prison, this is where Nelson Mandela was imprisoned for 18 of the 27 years he served behind bars. In addition to Mandela, two other South African presidents, including current President Jacob Zuma, were former inmates here. It is now a museum and the tour guides are former prisoners. Buenos Aires, Argentina to Cape Town, South Africa. Direct, it’s a bit over four thousand miles. Not bad. That would be about eight hours on a plane. If there was a plane from Buenos Aires to Cape Town. But there isn’t. For me, or for the bike. South African Airways used to fly between these two cities, but no longer does. Which means that instead of eight hours to cover 4,300 miles, it now takes 37 hours and just over 13,000 miles to travel between South America and South Africa. 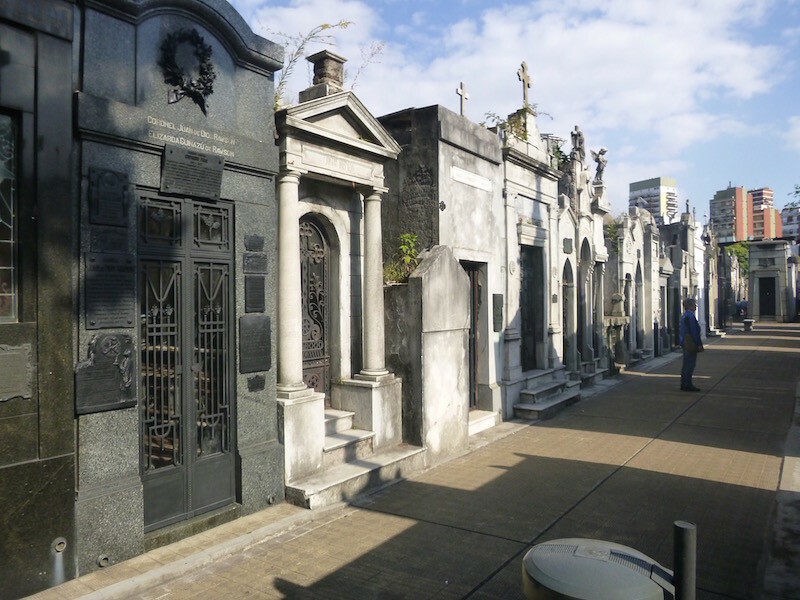 I left Buenos Aires at 9:30pm on Thursday night. 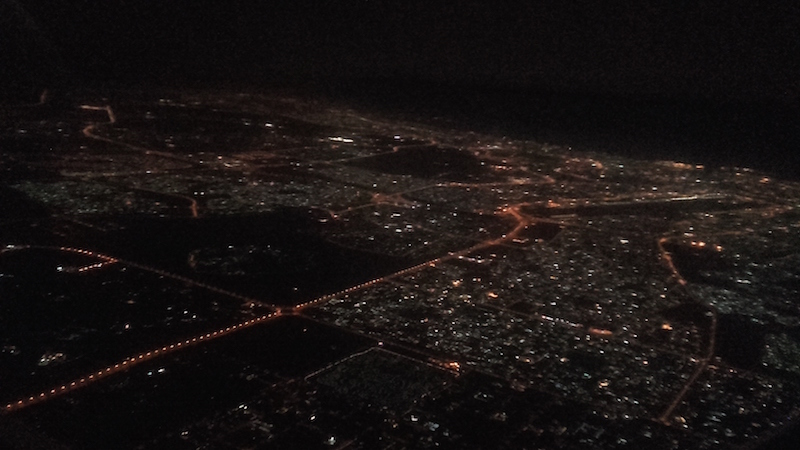 Eighteen hours later (and seven hours of time zone changes), I landed in Dubai, UAE, at 10:30pm Friday night. I’ve traveled to Japan many times from the United States, but this was the first time I had been served dinner, breakfast, lunch, and dinner again on a flight. I had a nine and a half hour layover in Dubai, and the airline provided me with a free hotel room near the airport to get some proper sleep before continuing on in the morning. I was a bit disappointed to be there only at night, and not get to experience this incredible city in the daylight. But I was also exhausted from being on a plane for so long, and was ready for a bed. Arriving in Dubai Friday night. The hotel apparently functions solely as a stopover for Emirates Airlines. When I checked in, they already knew my schedule, and had already set up a 5am wake-up call, and informed me that check-out was at 6am (how’s that for efficiency?). By 6:30am I was back at the airport and about to board my nine hour flight to Cape Town. You’ve probably never heard of more than half of these movies. I hadn’t either. But I have to say, they were all good. Some were good for helping me catch up on my sleep. Others, like Barney Thompson, were just plain strange. 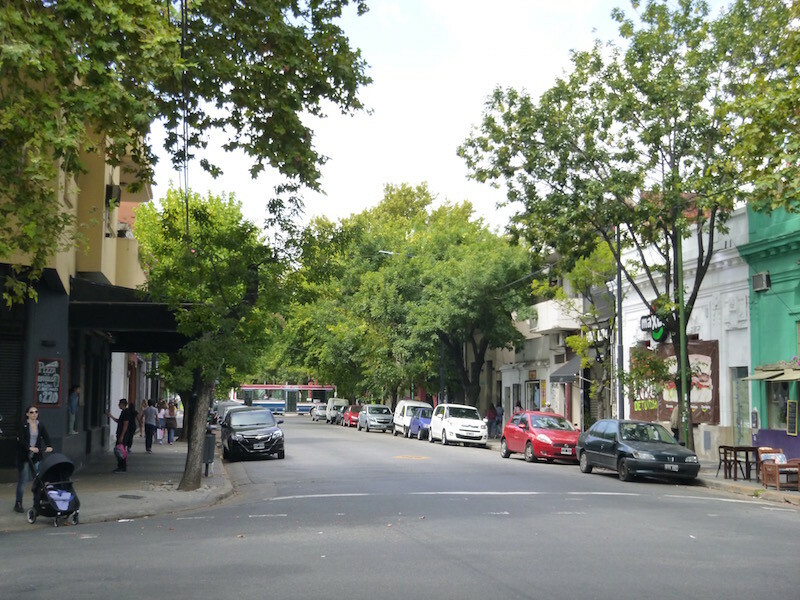 As of this writing, the bike hasn’t left Buenos Aires yet. It will fly to London, then change planes and head to Cape Town, and should arrive here Tuesday afternoon. Meanwhile, I’m on foot (well, foot and a half, actually; my ankle swelled up tremendously from all of the plane time, but I’m still walking fairly well), so I plan to do some walking today, and head to the shopping area to acquire some things that I couldn’t fly with, such as gas canisters for my camp stove. 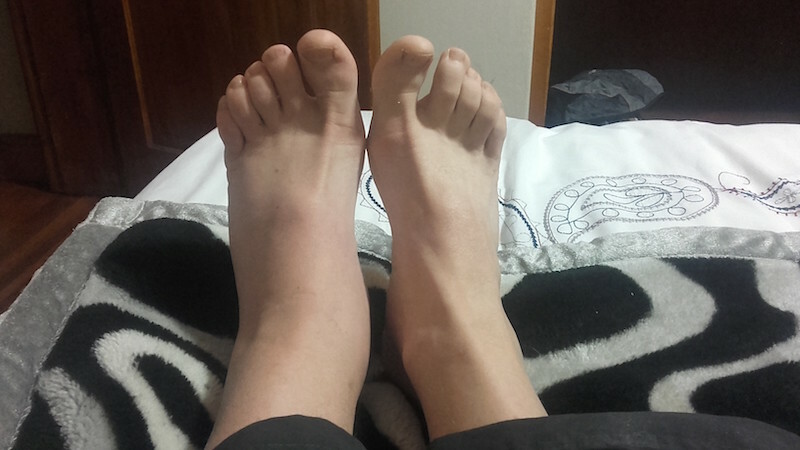 27 hours in economy coach seating is not good for the ankle. The area I’m staying in reminds me a lot of Southern California, and in particular Orange County. The neighborhood, the weather, and the landscape looks and feels a lot like it. Since I’m restricted to short distances for a few more days, I probably won’t post much until the bike arrives, unless something interesting happens between now and then. Otherwise, I plan to catch up on my reading and rest until then. Never let it be said that I am not capable of doing some really stupid stuff. Yesterday is just my latest shining example. Yesterday (Tuesday) was supposed to be “shipping day”: the day I took the bike to the airport and delivered it to the shipper. I had a 10:30am appointment at the cargo terminal. It takes just under an hour to get to the airport from where I am staying in Palermo, and I needed to get just a little gas before heading that way so I wouldn’t run out (the bike is supposed to have less than two liters of fuel in it when it goes on the plane). I made sure the bike was sorted, packed and ready to go the night before. Tuesday morning I left about 9am, and rode a block to the gas station where I bought exactly two liters of fuel, figuring I would burn about a liter on the way to the airport. After getting fuel, I pushed the bike off to the side, out of the way, and pulled out my waterproof zip-lock pouch with all of my documents in it. I looked at the information from the shipping broker, DakarMotos, which had the GPS coordinates of the cargo area on it, and entered the coordinates into the Maps.Me app on my phone. The route came up, I slid the pouch into my tank bag, put my gloves on, and set off for the airport. About two miles up the road, I stopped at a stoplight. A cab pulled up behind me, honking furiously. I looked back, and the cab driver was pointing behind him and yelling something at me, but with all of the traffic noise I couldn’t hear him. I assumed I must have run a red light or cut him off in traffic, so I simply waved at him and when the light turned green, I took off. About a half mile later, I looked down and noticed my tank bag was open. And my document pouch was gone. Massive panic immediately took over. The pouch contained the original title to my bike, my Argentina temporary import certificate, my Argentina reciprocity fee document, the shipping paperwork for the bike, and a bunch of other stuff that I can’t even remember. I spun an illegal U-turn in the middle of an eight lane busy avenue and started splitting lanes as fast as I could to get back to where the cab driver had been honking at me. I rode in the gutter, between cars, around trucks and buses. When I got back to the street where the cab driver waved me down, I rode slowly up and down the street all the way back to the gas station, several times, looking for my documents. I kept thinking someone would see me and yell at me, waving my documents. No such luck. Dejected, I went back to the apartment, and set off on foot to walk the entire route. I spent another two hours walking both sides of the street, looking on cars, in windows of buildings, in trash cans, everywhere I could think, with no success. 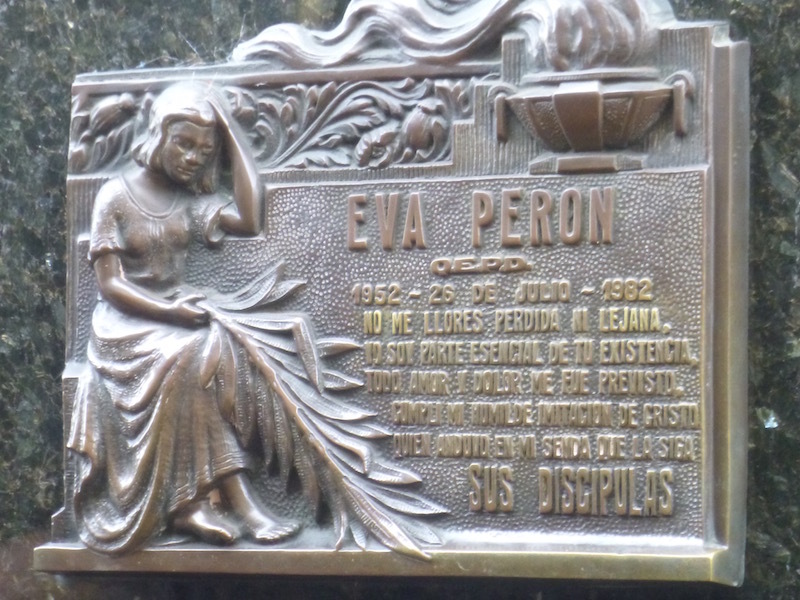 Eventually, I began to accept that my documents were gone, and I was stuck in Argentina. 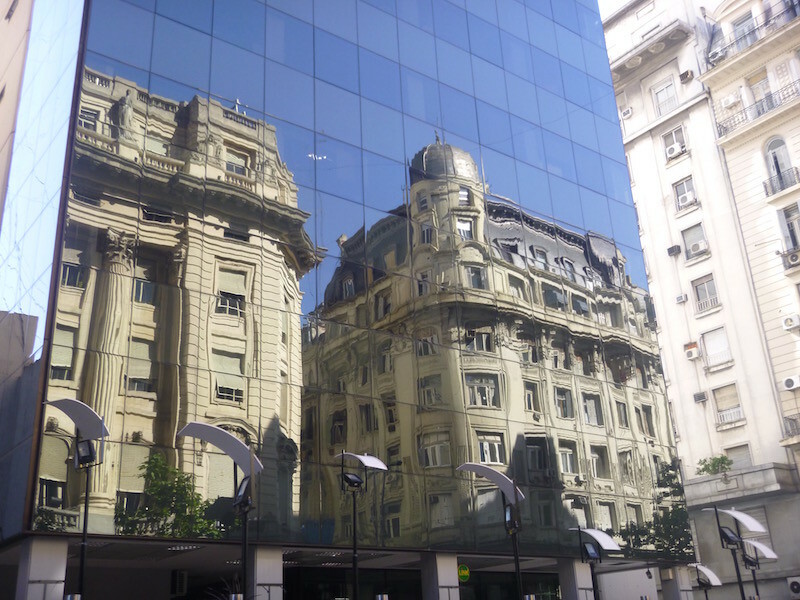 I wasn’t sure how long it would take to get a replacement title from the US, and a new temporary import document from the Argentina Customs offices, or if that was even possible. Fortunately, I had two pieces of good news: first, I had the original Texas registration for the bike in a different pouch at the apartment, and I thought I might be able to use it in lieu of the title at Customs. Second, Sandra and Javier at DakarMotos had photocopies of my temporary import certificate, which I hoped would make it easier to get a replacement original. I contacted Sandra, and after a long discussion with the airport Customs officials, she suggested I file a report with the local police, and get an affidavit from them advising that I had lost the documents. So after a couple of hours at the police station, and the help of Sandra’s daughter-in-law acting as translator, I walked out with the affidavit. Meanwhile, my brother in Texas was working on getting a certified copy of my title from the Texas DMV. I was somewhat shocked to learn that I could send him an email and he could take it to the DMV and they would give him a copy of my title. For all the difficulties I usually suffer at the DMV, this seemed way too easy. Perhaps they felt sorry for me? Nah, it’s still the DMV. I went to bed with the bike still in the garage…it should have been on a plane or at least in the cargo area at the airport. I couldn’t help but think of all the things that had to be addressed now: besides documents, there was local logistics (I had to be out of the apartment by Friday morning, as new renters were moving in, and now I had two large roller bags with all my stuff packed in them that wouldn’t fit on the bike); travel logistics (I was going to miss my flight Thursday night, and I wouldn’t arrive in Cape Town when I was supposed to, so my hotel reservation needed to be changed or canceled); and bike logistics (what if I exceeded my time limit in Argentina waiting on documents? I had no document to allow me to exit the country with the bike and then return to start the clock over). It’s amazing how quickly the stress level can rise after months of virtually no stress. Eventually I took a deep breath, sat down and made my “to do” list, and got to work. 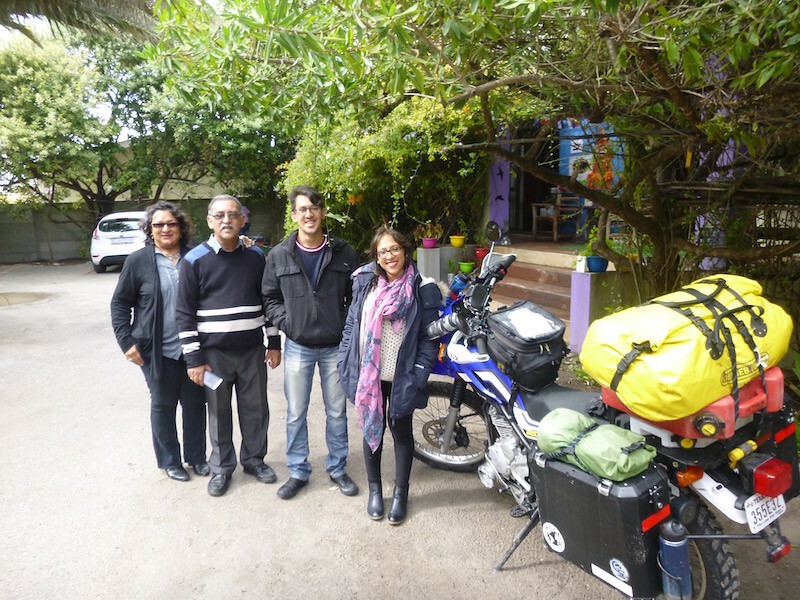 Sandra and Javier are experts at shipping bikes into and out of Argentina, and I was not the first person they had dealt with who for one reason or another didn’t have a full set of documents. After exchanging a few texts, Sandra agreed (for a small “Stupidity Fee”) to meet me at the airport Wednesday morning with the remaining copies of my documents that she had, along with the registration and police affidavit that I had, to see if we could convince Customs to accept what we had and allow me to ship the bike. 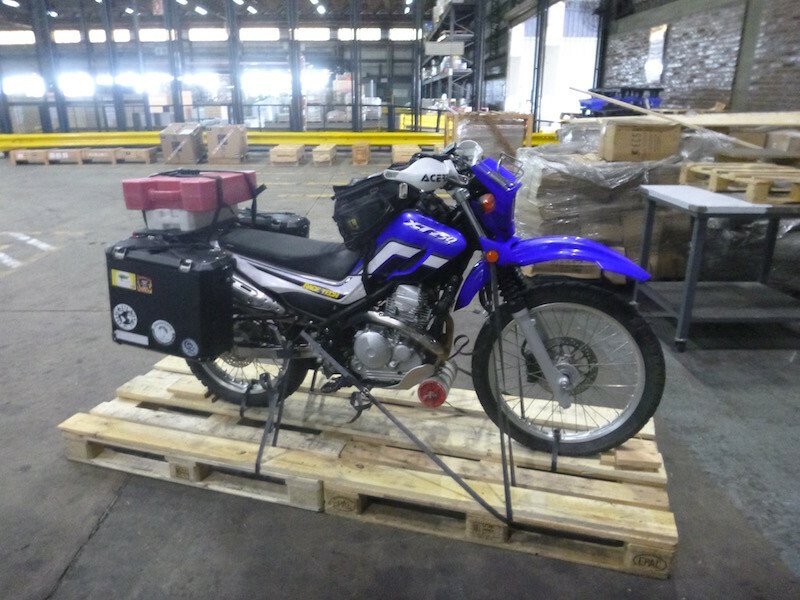 After four hours, and another hand-written statement explaining what had happened, I was allowed to take the bike into the freight warehouse and put it on the pallet. Things were once again moving forward! 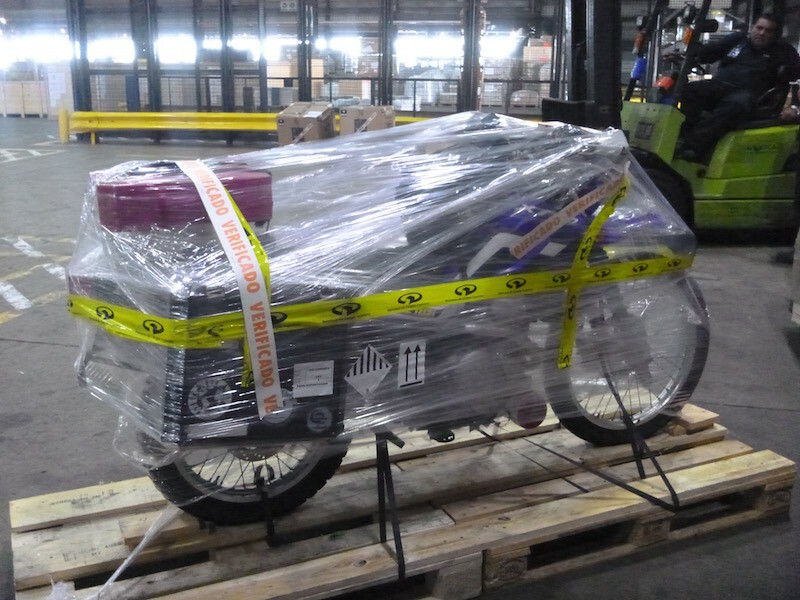 Before putting the bike on the pallet, I rolled it onto a freight scale. The fully loaded bike, with everything except my camping gear, weighs 174.5 kg, or 384 pounds. 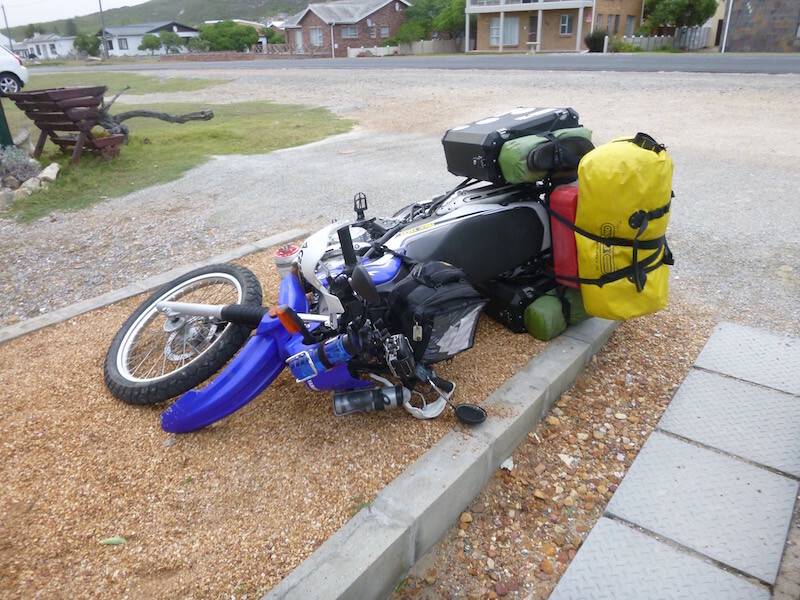 For reference, an unloaded BMW 1200GS weighs 260kg, or 573 pounds dry, and a stock KLR650 with no luggage weighs just more than my fully loaded bike, at 176 kg claimed dry weight. It’s definitely getting real now. This is the first shipment for the bike with the exception of the Stahlratte; I’ve ridden it everywhere until now. It’s a lot farther to ride home from Africa than from Argentina. And finally some good news: since my bike is considerably smaller than the typical 1200cc adventure bike, the shipping cost turned out to be 20% less than I was originally quoted. So even with the Stupidity Fee it turned out to be less than I had budgeted. One more day in South America, then a very long flight to South Africa. With the bike prepped and ready to deliver to the shipper on Tuesday, I have a few days to relax, wash gear, pack everything, and see the sights. 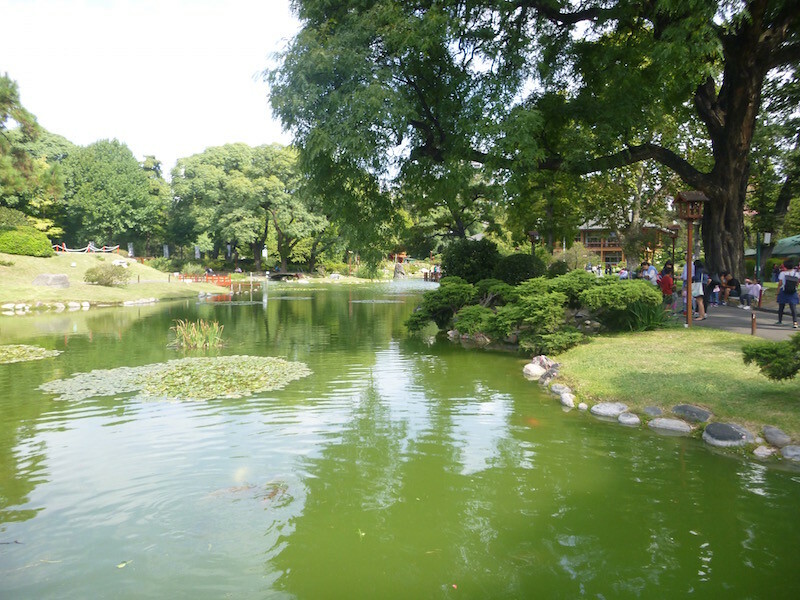 This is a very lively city, with tons of sidewalk cafes and beautiful parks. Today I walked about six miles in one direction, then caught a cab home at the end of my tour. 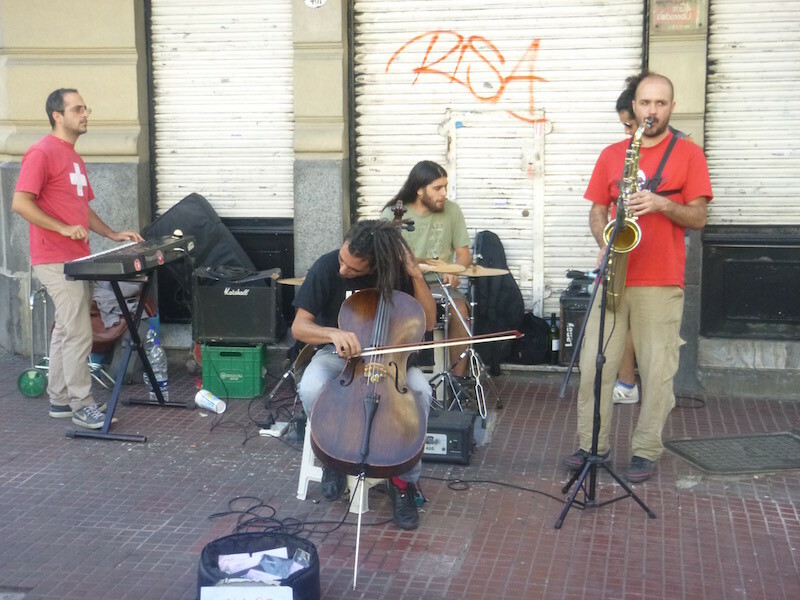 From the apartment, I walked to Plaza Serrano, a small park surrounded by bistros and sidewalk bars and cafes. Being Saturday, the park was covered with arts and crafts vendors selling their wares, while others continued to assemble more booths for Sunday’s large event. I stopped at a nearby cafe for a couple of empanadas and a smoothie, then continued walking northeast. The trees and plants here are beautiful. 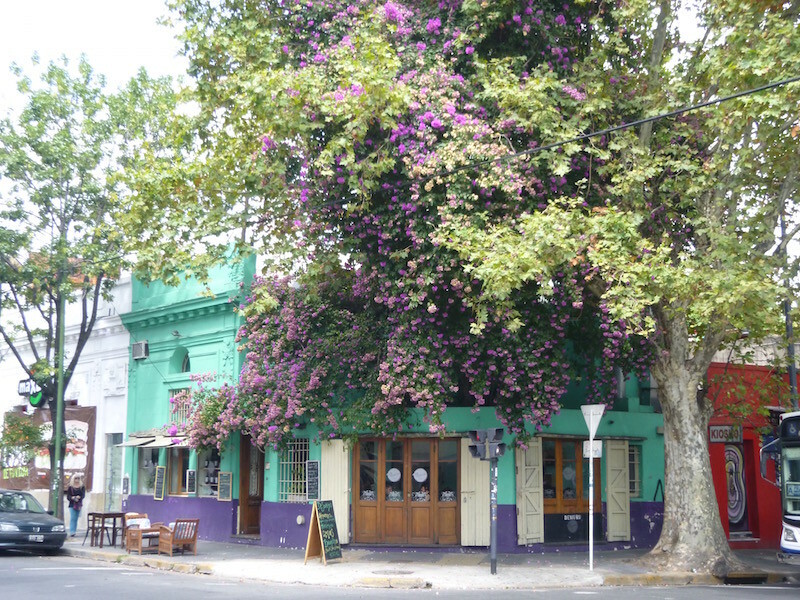 The front of this cafe was covered in an enormous bougainvillea. 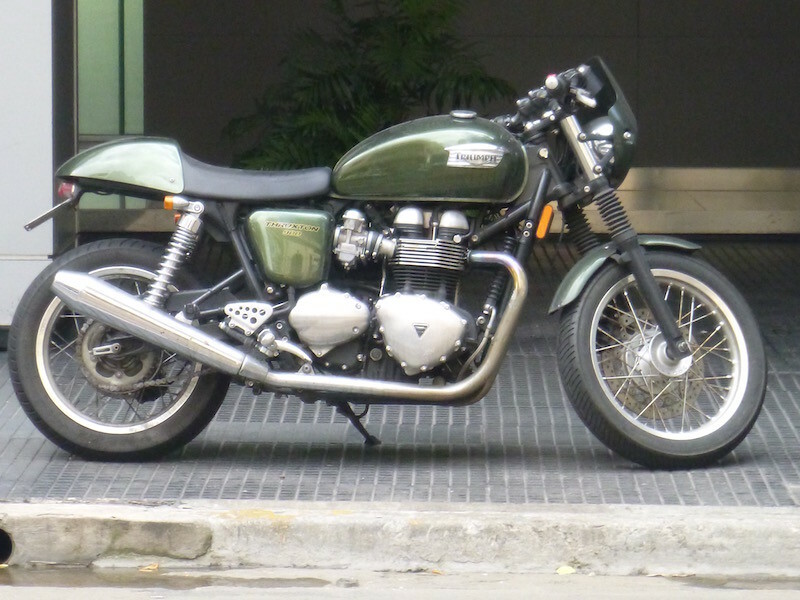 Saw this nice Triumph parked on the sidewalk while walking along. 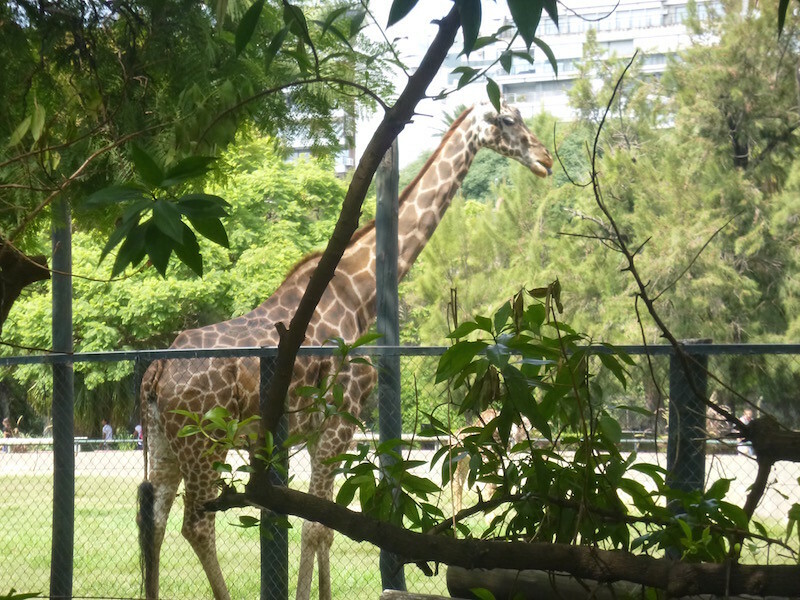 My route took me past the Buenos Aires Zoo. Beautiful place…I might even go back and pay to go in. 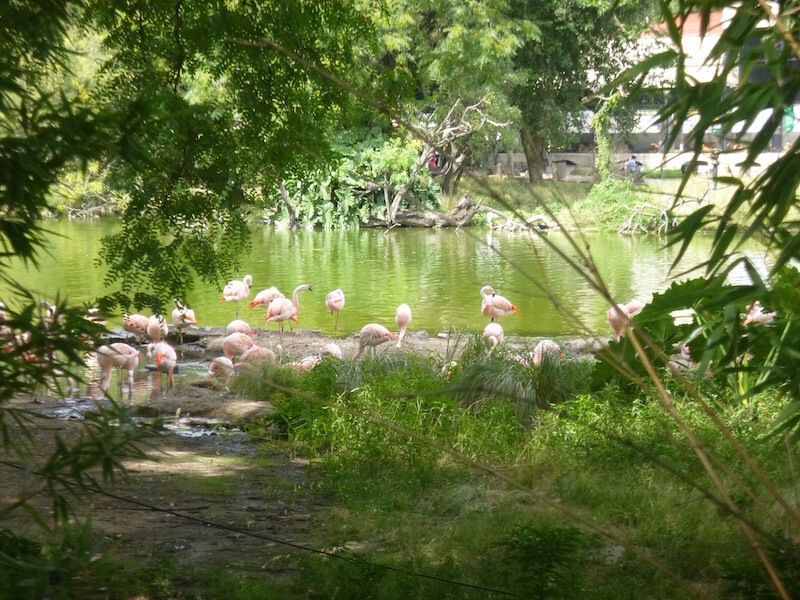 But for free, from the sidewalk, I saw flamingoes, giraffes, and hippos. For a moment I couldn’t help but think about the expense of shipping to and from Africa, versus walking past the zoo here and seeing the same animals. 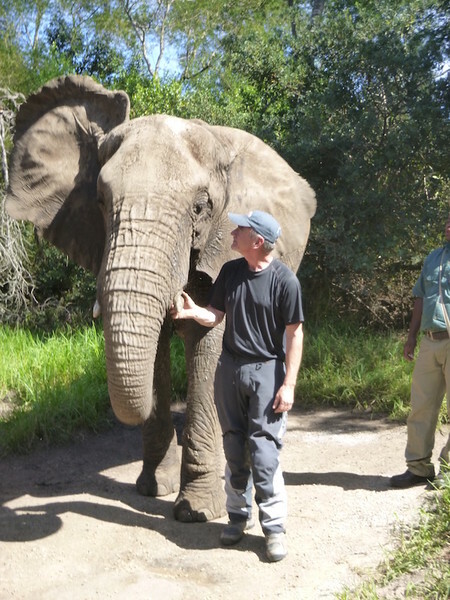 Yeah, I know….I’m going to Africa. Past the zoo, I walked through several more large, shaded parks. 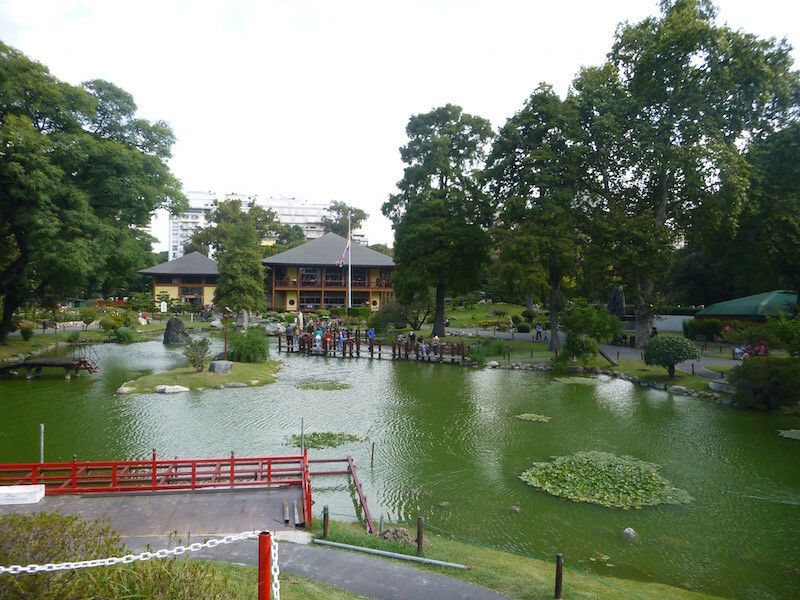 In the corner of one, near Plaza Italia, is the Jardin Japones, or Japanese Garden. 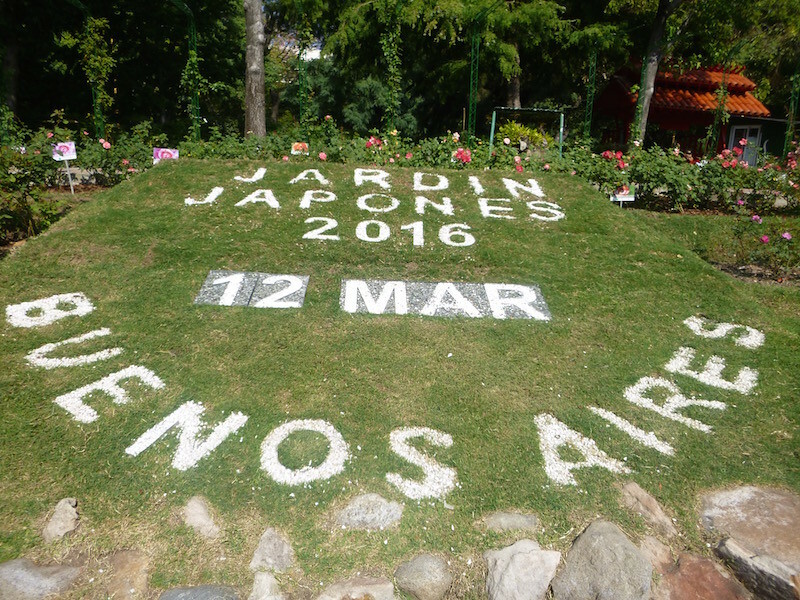 I found my ultimate dream job: I want to be the guy that changes the date every day on this rock calendar at the Japanese Gardens in Buenos Aires. The most stress he could possibly experience is leap year. 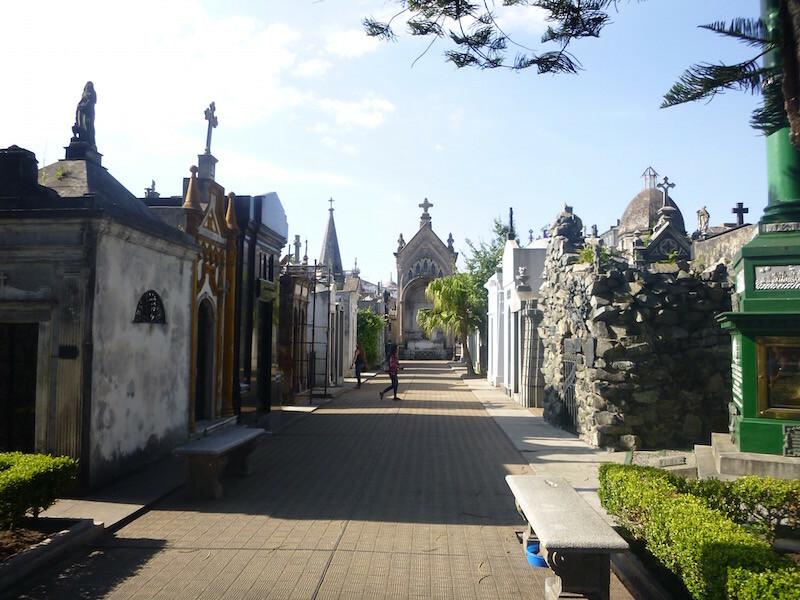 Eventually I made my way to the Cementerio del Recoleta. 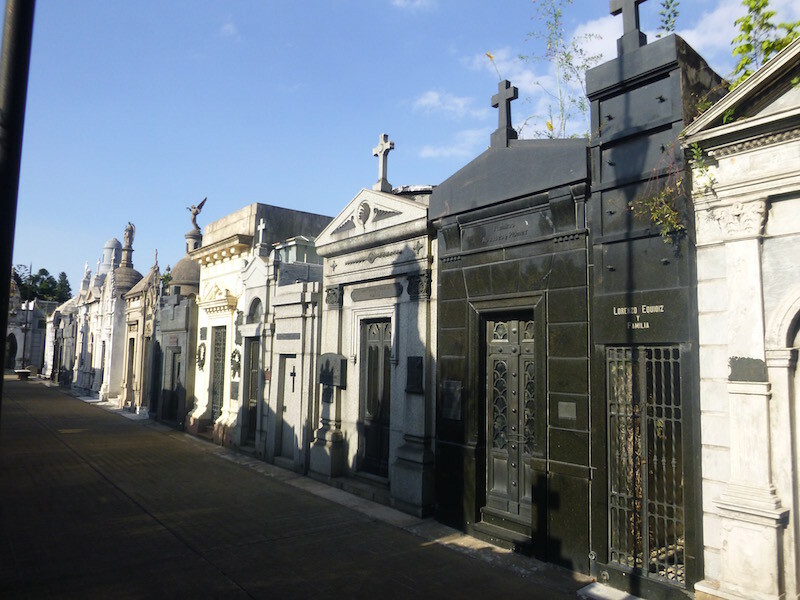 This huge cemetery in the middle of Buenos Aires is absolutely incredible. Well worth the price of admission, which by the way is nothing. Nada. Free. 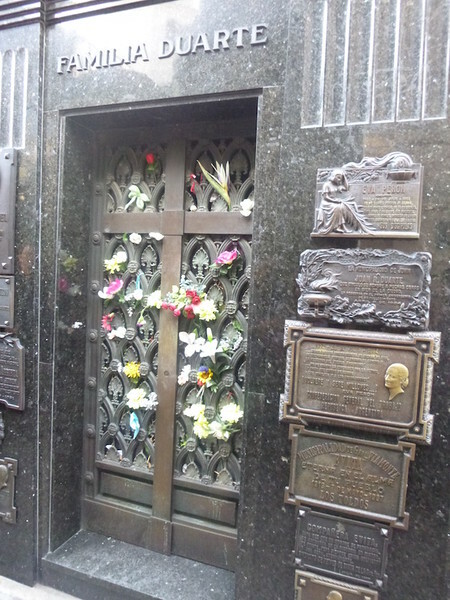 Cementerio del Recoleta. Feels like a small city of buildings. 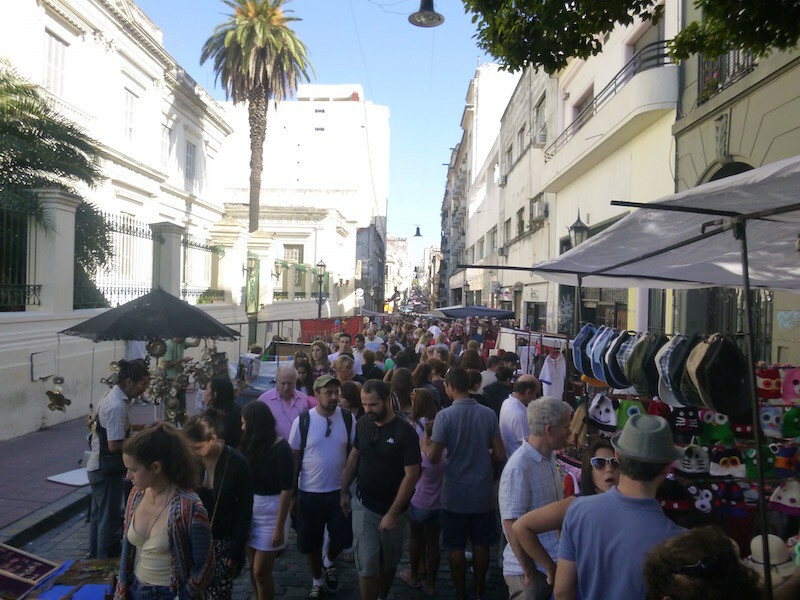 Next up was Calle Defensa, a street in the San Telmo district that is lined with flea market vendors on Sundays. Probably a kilometer of them. 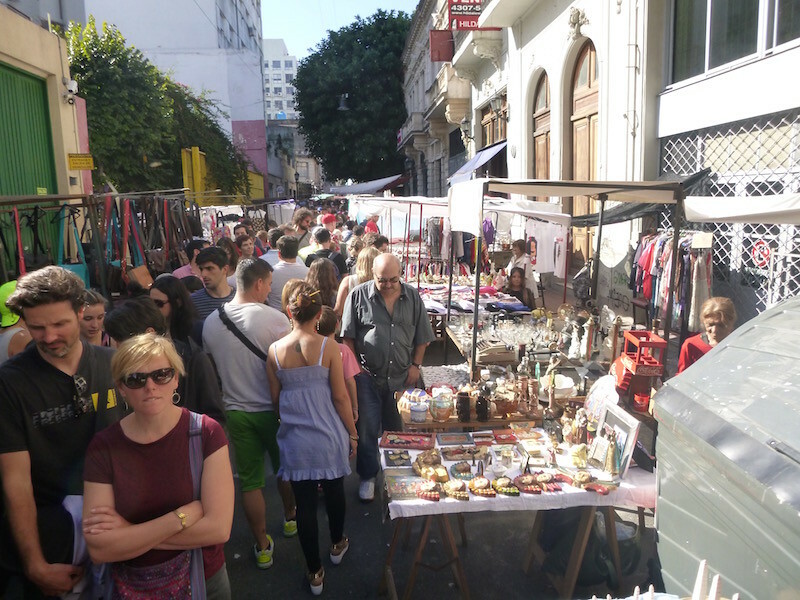 With a few side streets joining in with vendors as well. 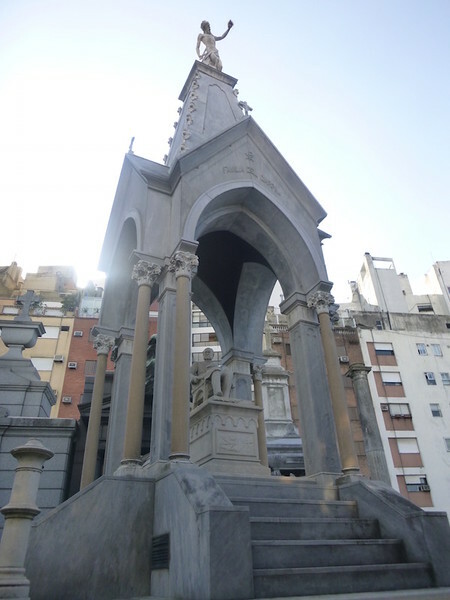 It ends at Plaza de Mayo, which is also filled with vendors. 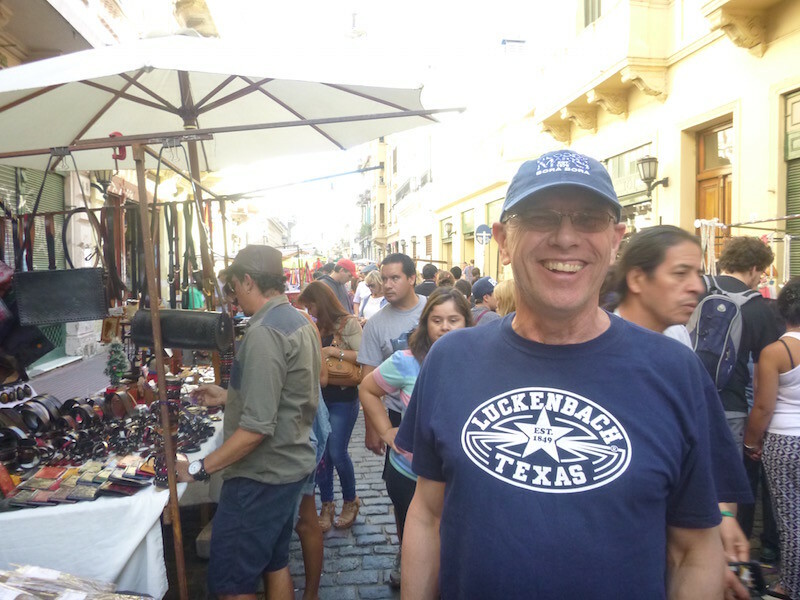 I ran into this guy with a Luckenbach Texas t-shirt. 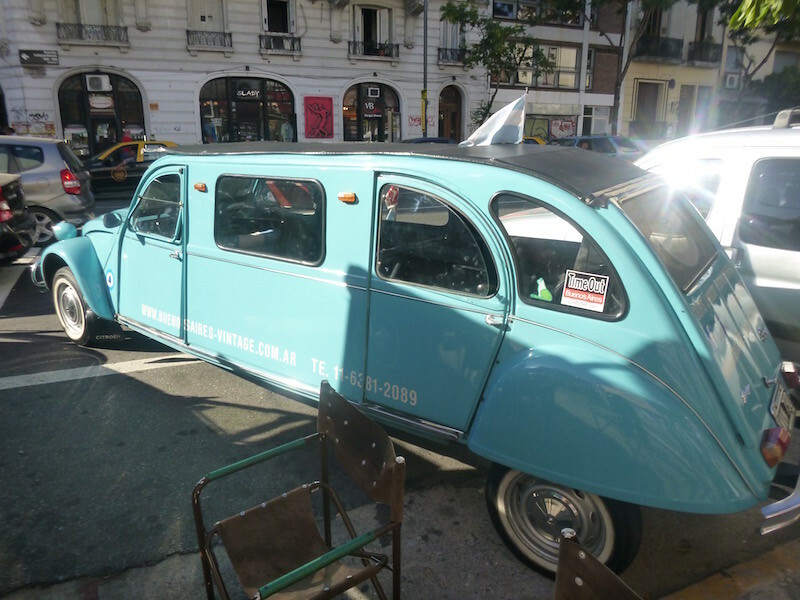 You can tour Buenos Aires in a stretch limo Citroen 2CV. 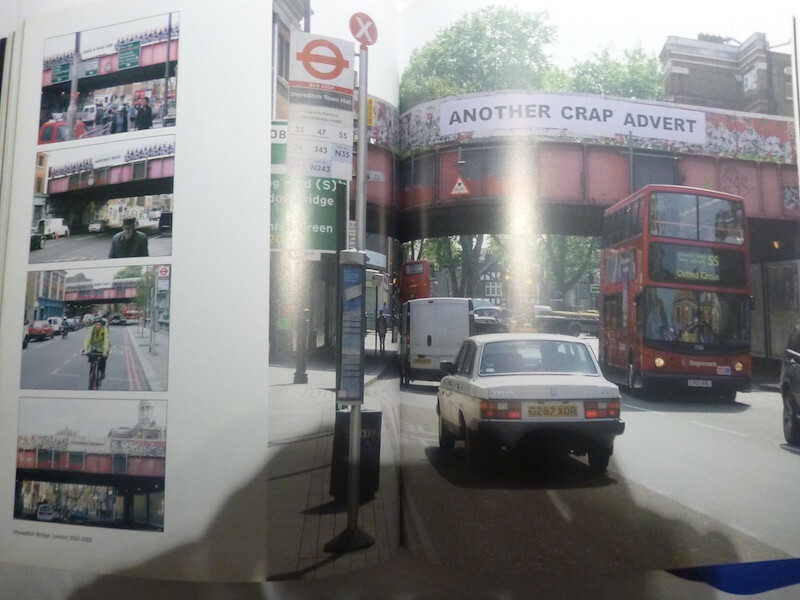 Then back at the apartment, I was looking through a coffee table book on Banksy, the graffiti artist, and ran across this. 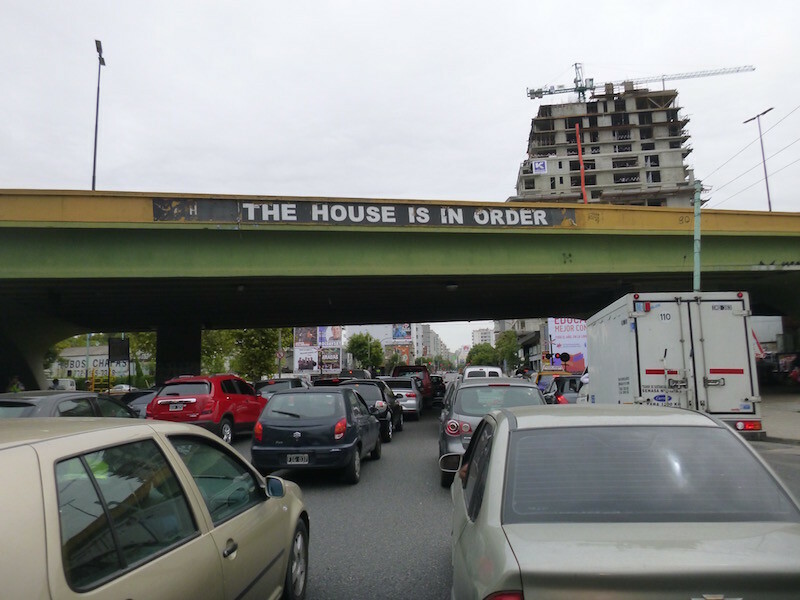 Apparently there is quite a bit of copy-cat Banksy artwork in Buenos Aires. I’m guessing the overpass sign is one of them. Before I could allow myself to do any serious sight-seeing in this city, I needed to get to work: I had a list of items to be done on the bike before taking it to the airport for it’s first flight. First things first: get all the mud, dirt, and grime off so I can work on it. 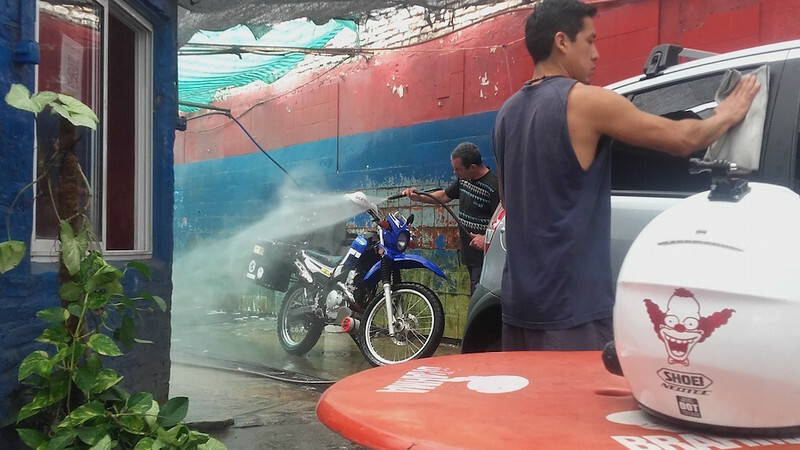 It’s nice to have car washes that will actually wash bikes too. These guys did a great job: they used degreaser, soap, and not too much pressure. Cost: about $7. The Butterfly Effect: lots of white butterflies on Ruta 3 heading north. 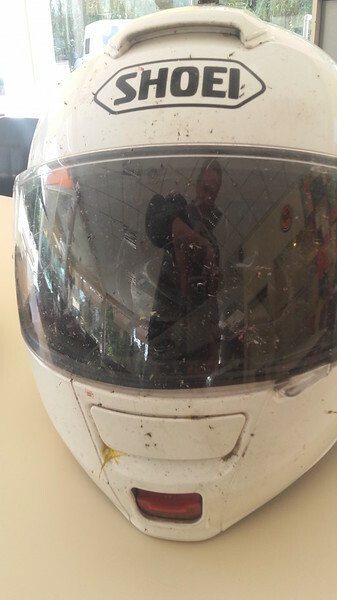 Many of them were kamikazes, turning my helmet into a sticky mess. Meet Paolo. This guy is awesome. 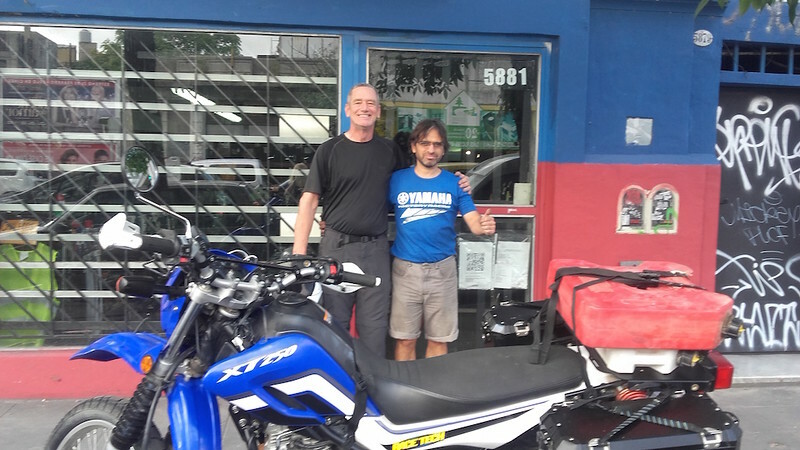 He runs Moto Avenida, a little one-man independent parts, accessory and service shop just around the corner from my apartment on Avenida Cordoba in Buenos Aires. I stopped in and asked him if he would let me use his shop to change my oil & filter and chain & sprockets. He gladly allowed me to use his space. I bought a few small items and my oil from him. As usual, not a word of English, but incredibly nice and helpful. I had to remove the swingarm to install the endless chain, but everything I did took about an hour and a half at his shop. Just coincidence that he was wearing a Yamaha t-shirt when I showed up. Back at the apartment, I removed the fuel tank and swapped out the fuel pump and fuel filter. 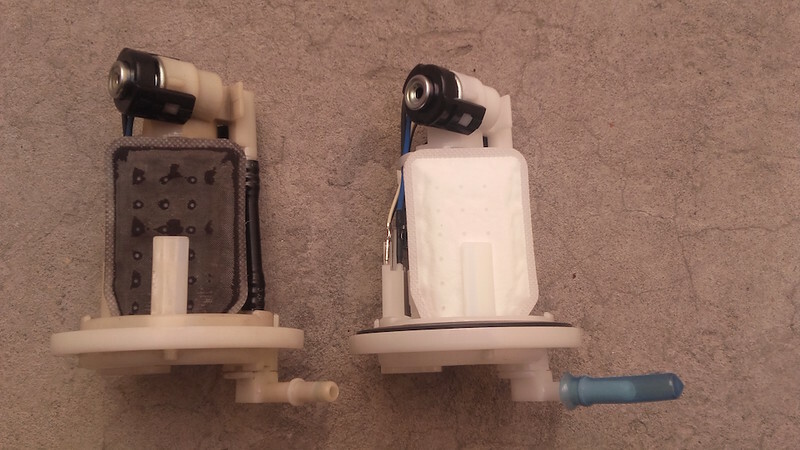 As noted earlier, there’s nothing wrong with the fuel pump, but unfortunately the in-tank fuel filter is part of the fuel pump and only comes as an assembly. One of these things is not like the other: old fuel filter/pump on the left. Filter is just a wee bit black compared to the new one. I’ll clean it again and keep it as a spare just in case. I also replaced the mirror that was broken when the bike was dropped off the worklift in Punta Arenas. I removed my GPS, its’ mounting dock and associated wiring for shipping, and installed a new air filter. At this point, the bike is ready to ship. I’ll cover those details Tuesday when it goes to the shipper.